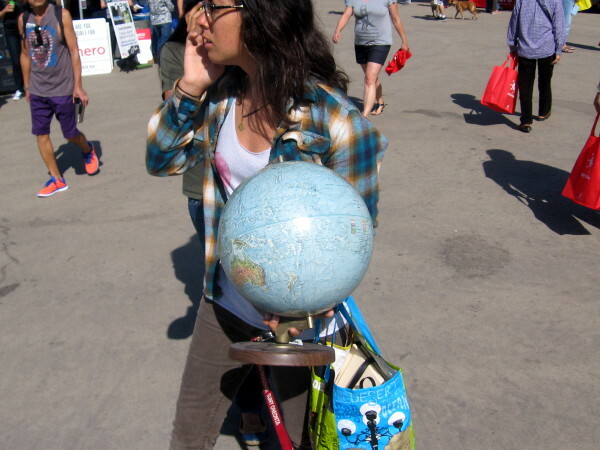 recycling – Cool San Diego Sights! 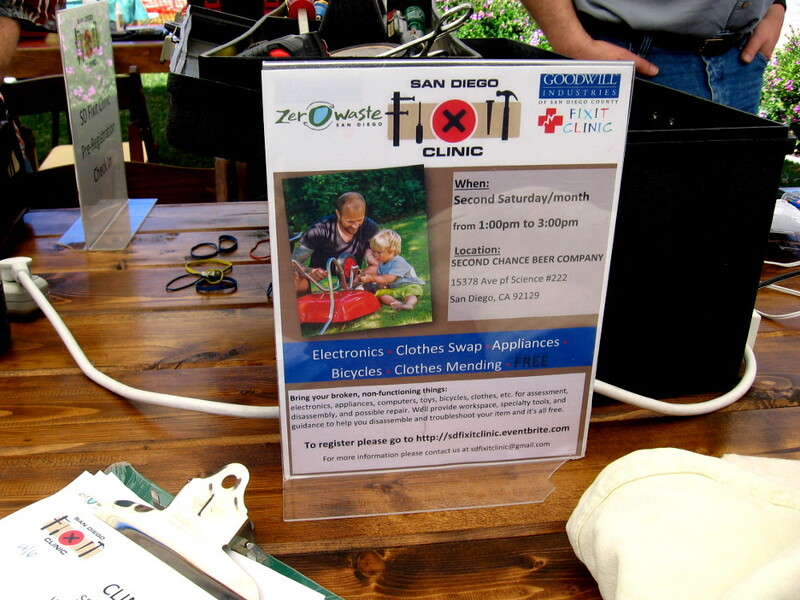 Balboa Park’s Sustainability Studio promotes conservation. 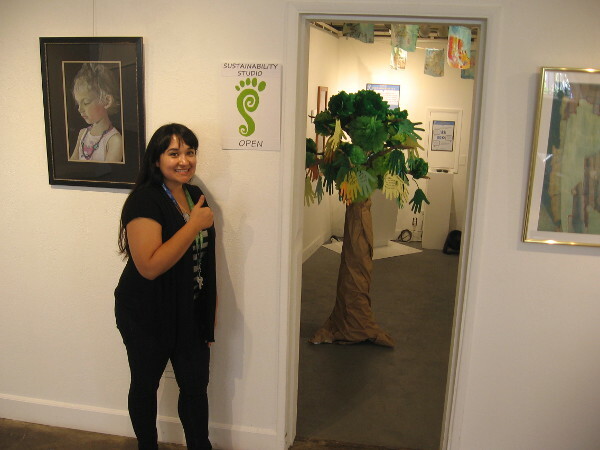 Gallery 21 in Balboa Park’s Spanish Village features a special environmental exhibit called Sustainability Studio! I discovered a fascinating environmental exhibit in Balboa Park this weekend. 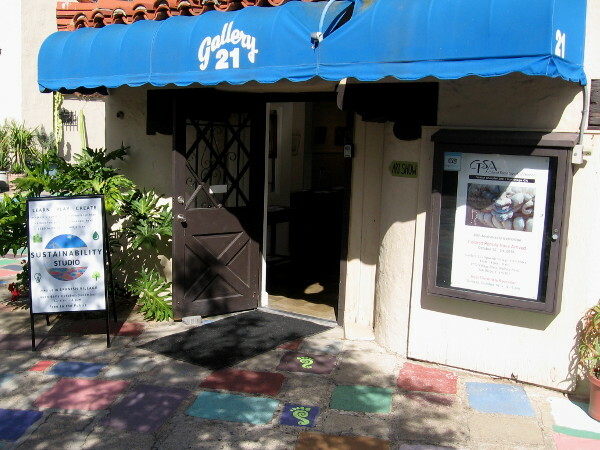 The Sustainability Studio is located in Gallery 21 near the center of the Spanish Village Art Center. 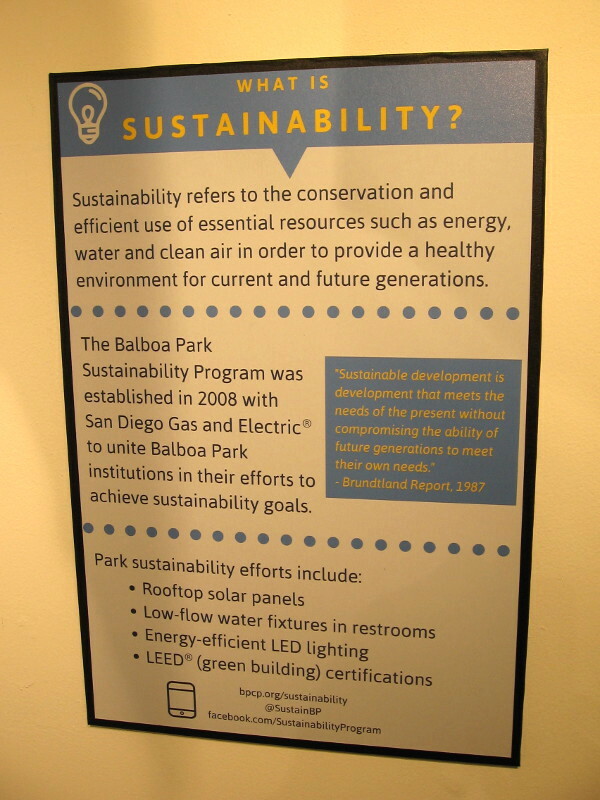 This small but information-packed exhibit discusses how various museums and buildings in Balboa Park are engaging in conservation efforts, by using solar panels, low-flow water fixtures, LED lighting, and the intelligent use of resources. 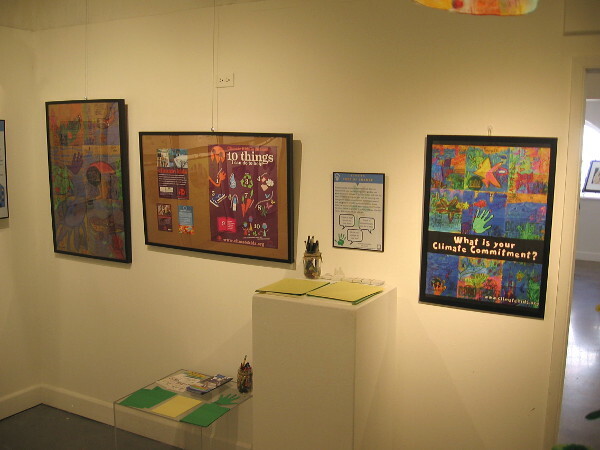 The exhibit also encourages kids to think about the environment and pledge to protect it. 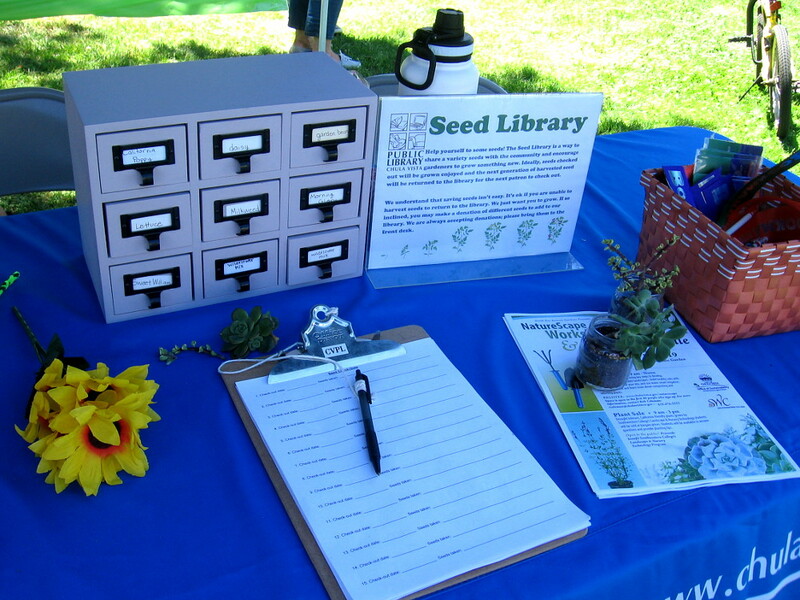 Fun activities include making leaves for the Tree of Change and a Balboa Park scavenger hunt! To read the signs, click the images and they will enlarge. The Sustainability Studio will remain open to the public through December. Bring the kids! They can learn something new, create some fun art, and engage in the easy scavenger hunt and win a cool prize! 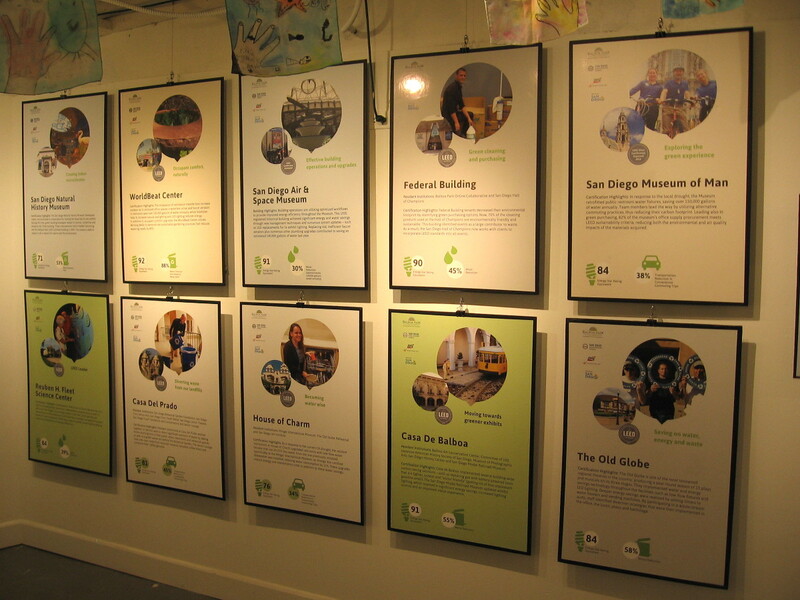 Rubi welcomes visitors into the Sustainability Studio, where one can learn about the conservation efforts of various organizations in Balboa Park. 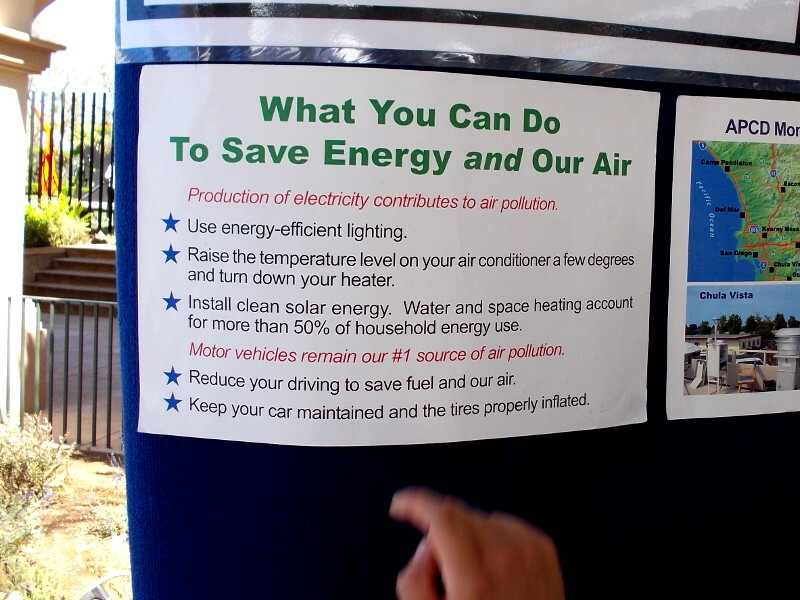 Signs and posters in the special exhibit raise awareness about various important environmental issues. 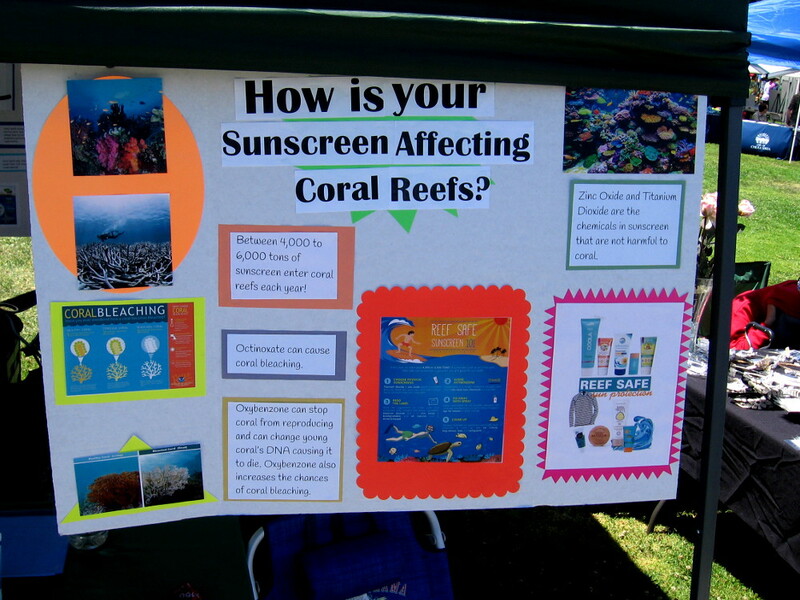 Kids are provided with fun activities that promote activism and conservation. 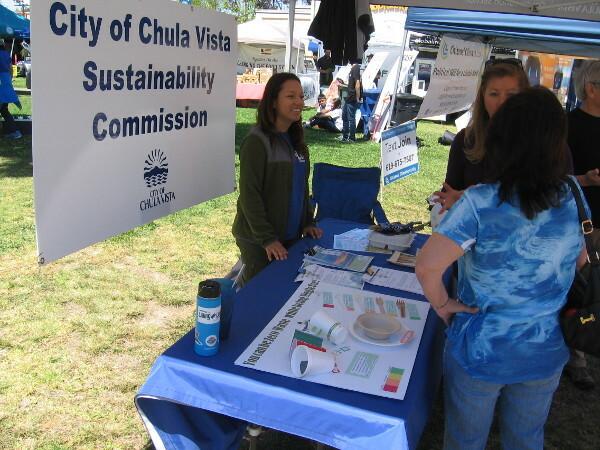 Sustainability refers to the conservation and efficient use of essential resources. 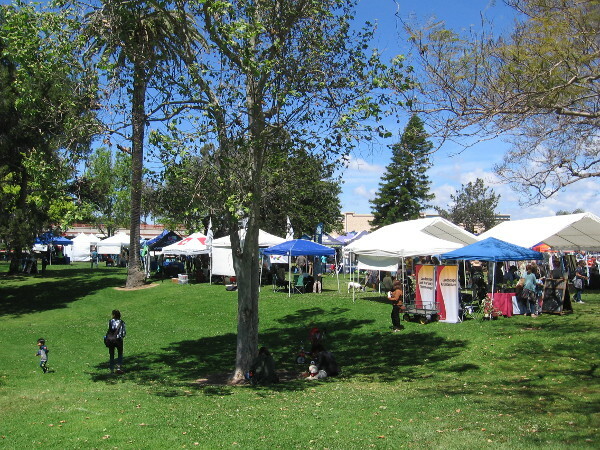 Balboa Park’s efforts include solar panels, low-flow water fixtures and LED lighting. 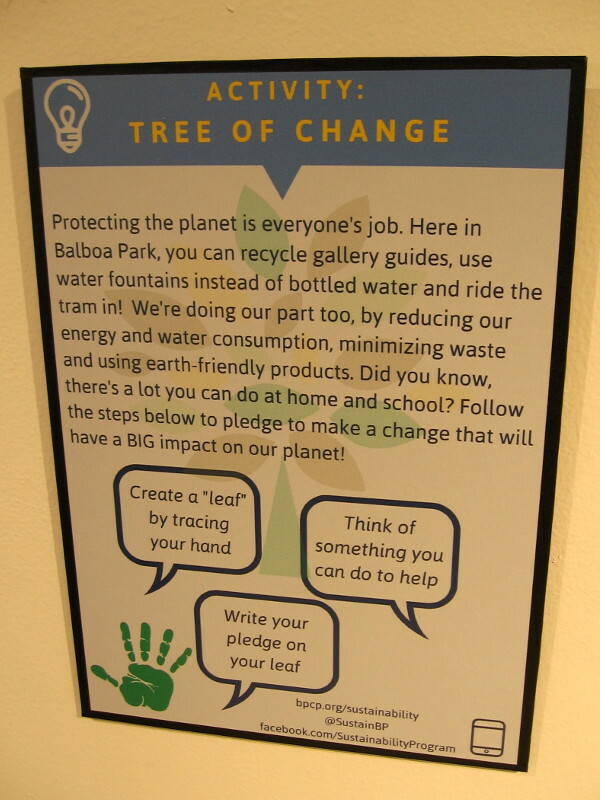 Kids visiting the exhibit are encouraged to make a leaf with a hand tracing, then inscribe it with an environmental pledge. 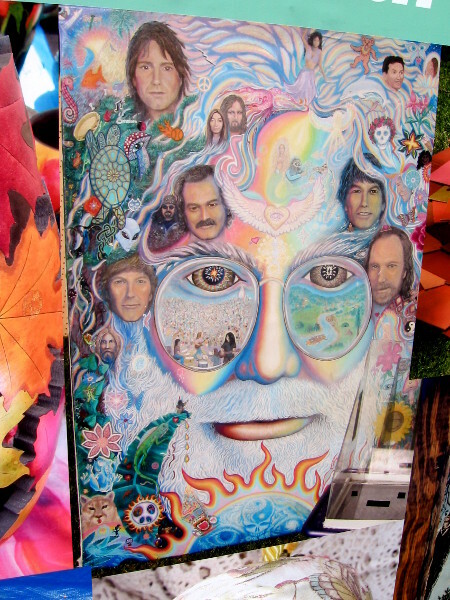 Leaves on the Tree of Change. 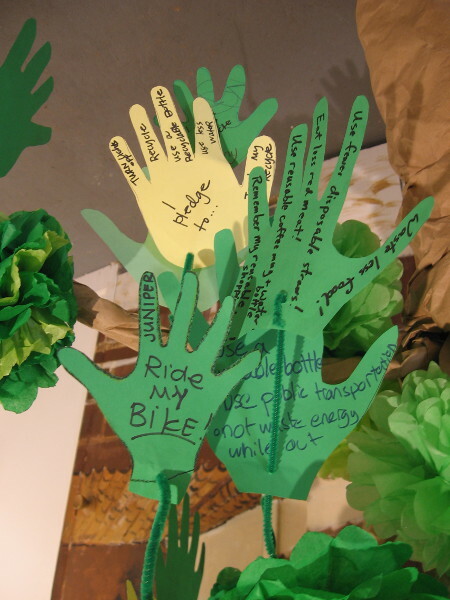 Kids pledge to ride bikes, turn off lights, recycle, use less water . . .
A scavenger hunt is described on this flyer. 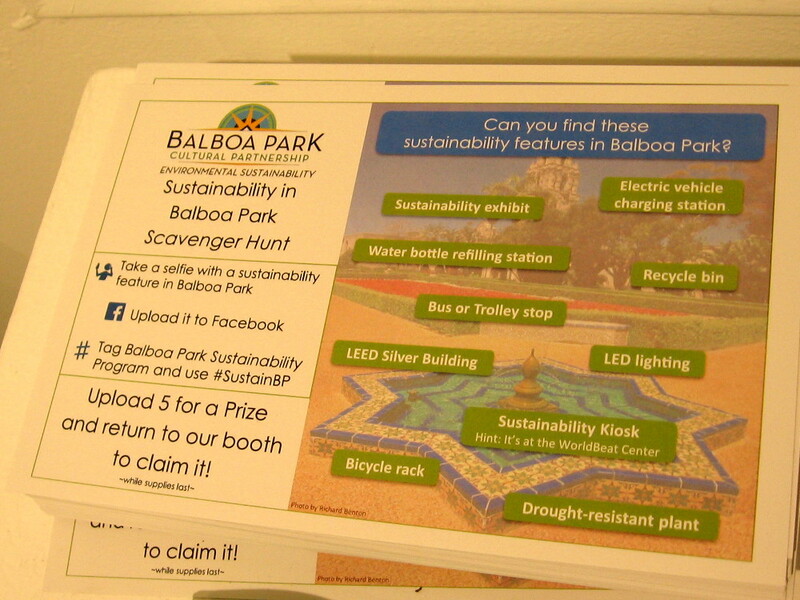 Upload 5 selfies to Facebook that include a Balboa Park sustainability feature and claim a great prize! 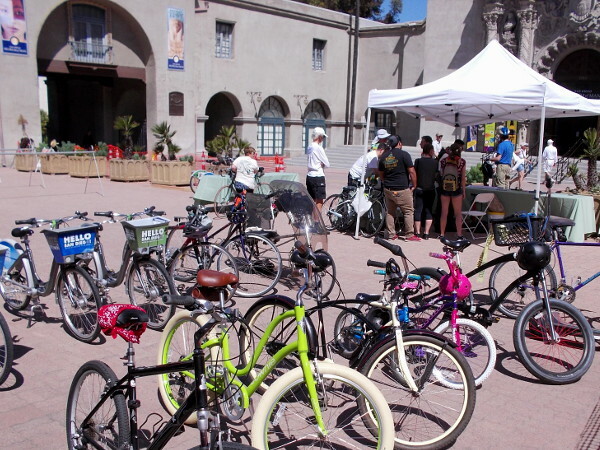 Various museums and buildings in Balboa Park are working to become more environmentally friendly. 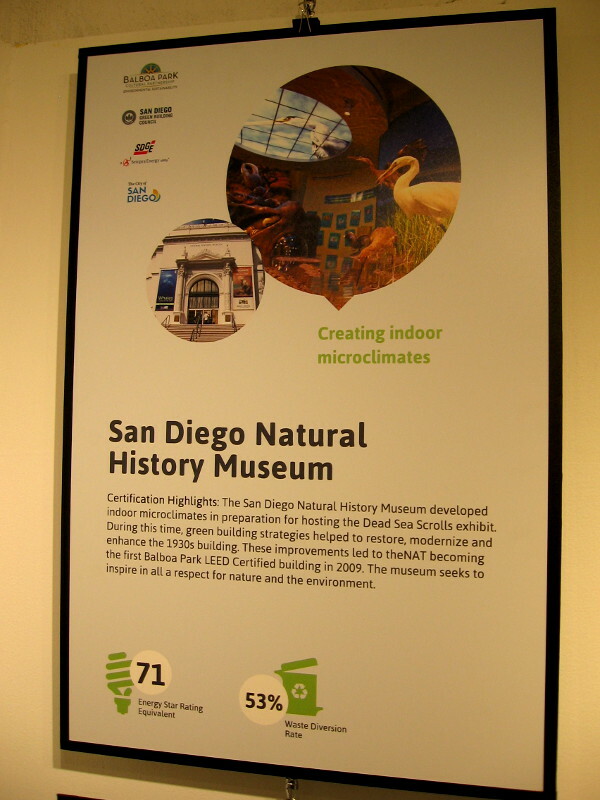 The San Diego Natural History Museum became the first Balboa Park LEED Certified building in 2009. 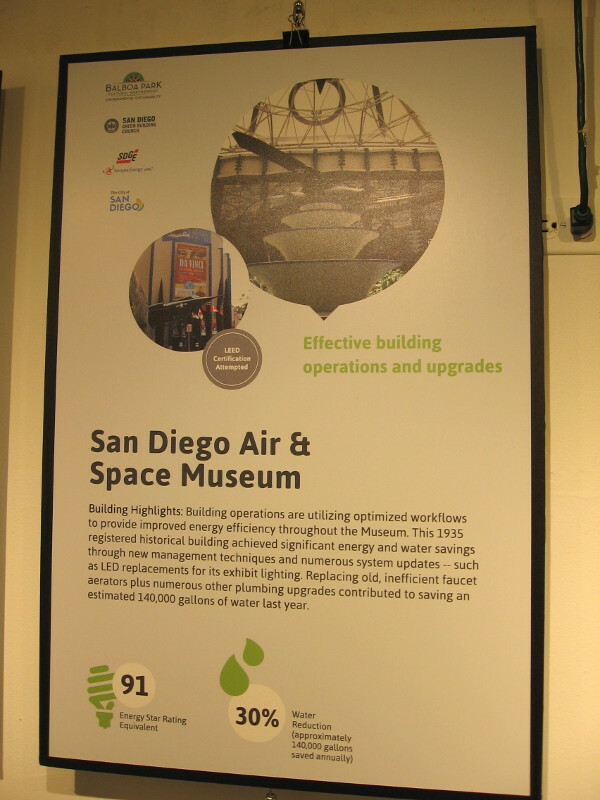 The San Diego Air and Space Museum has increased energy efficiency and achieved significant water savings. 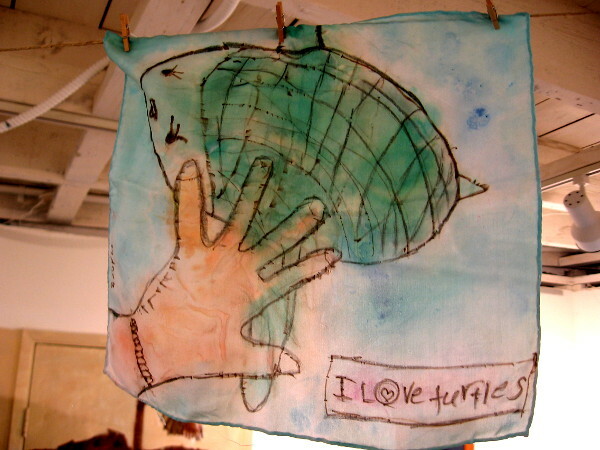 Fun works of art produced by creative kids hang from the ceiling. 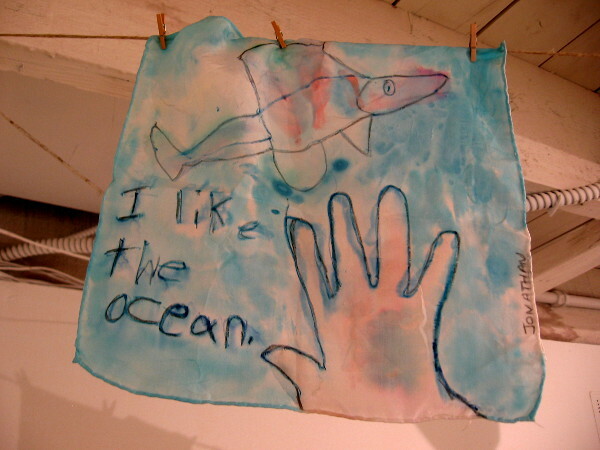 I like the ocean! 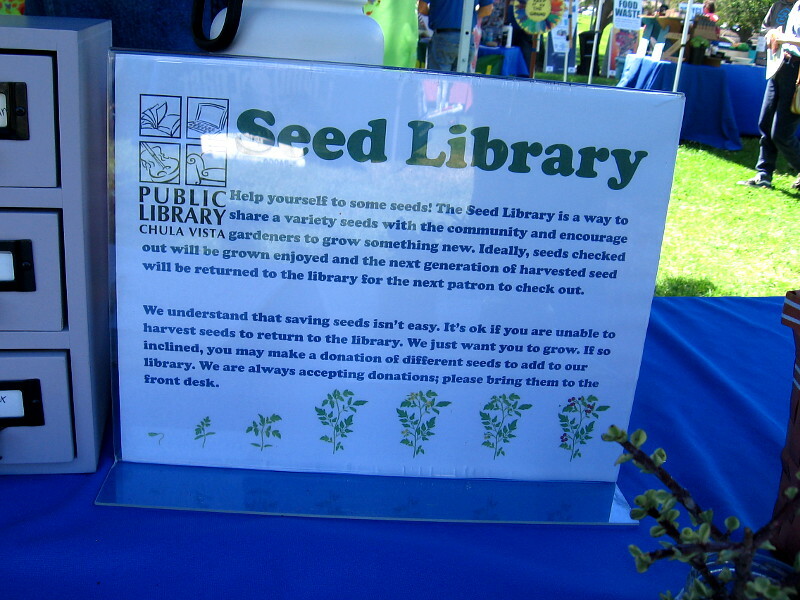 Posted on October 17, 2016 October 26, 2016 Tags activism, art, balboa park, buildings, education, environment, kids, museums, recycling, san diego, spanish village, technologyLeave a comment on Balboa Park’s Sustainability Studio promotes conservation. 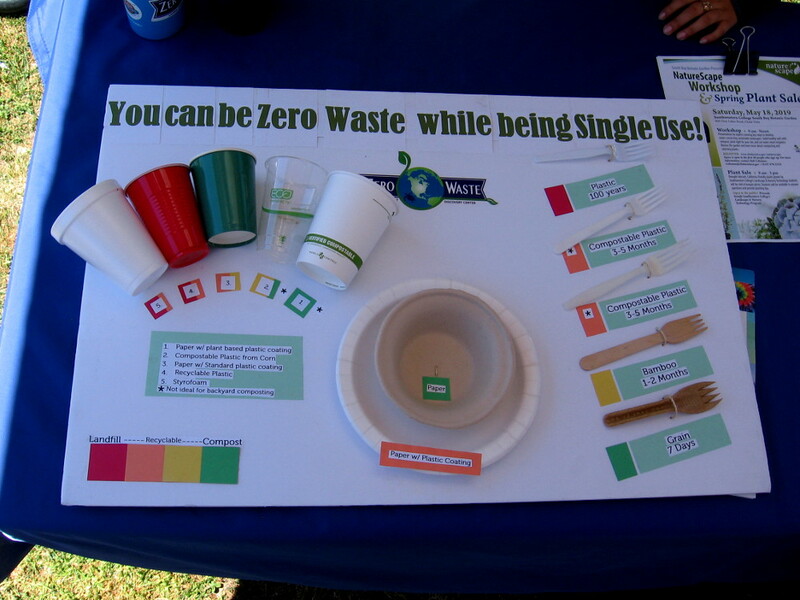 Help protect the environment: Cool ideas at EarthFair. Use cans and old kitchen tools for plant pots! 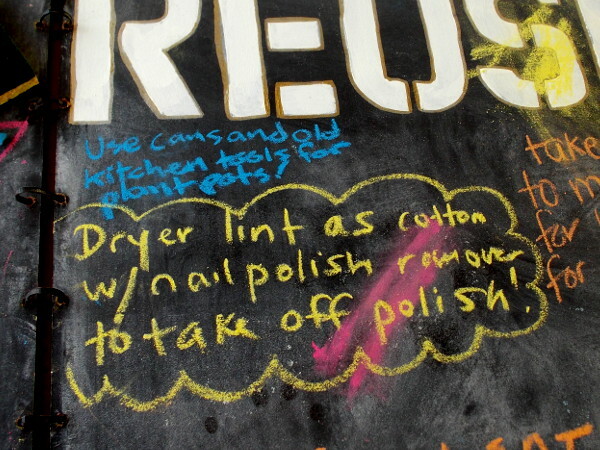 Dryer lint as cotton with nail polish remover to take off polish! 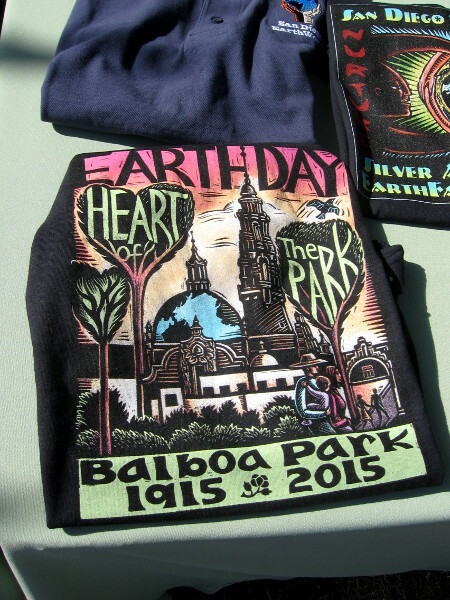 Late this morning, I walked from Cortez Hill to the 2016 EarthFair in Balboa Park. 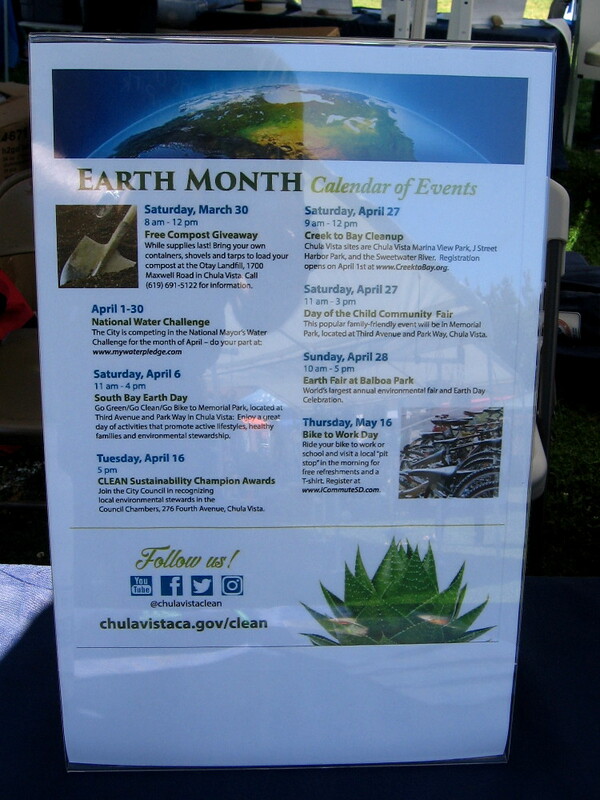 The cool event, corresponding with Earth Day, is the largest annual environmental fair in the world! 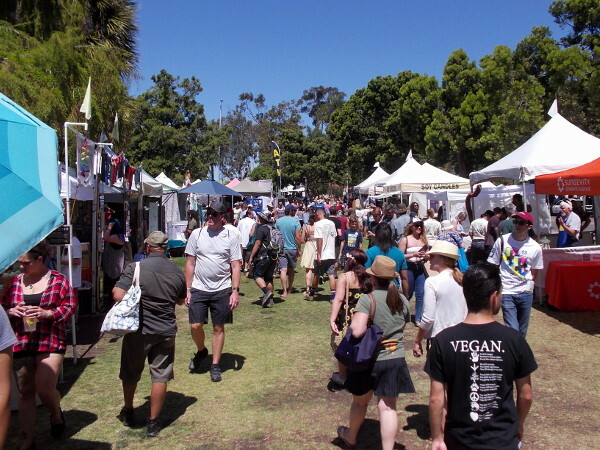 Thousands turned out today for the 2016 EarthFair in Balboa Park. 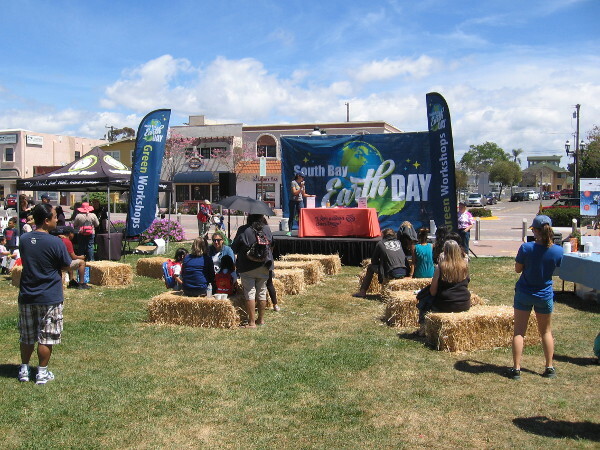 San Diego residents celebrated Earth Day and learned how to help protect the environment. I blogged about EarthFair the last couple of years and showed you a little bit of almost everything–so this time I decided to take a different, more practical approach. 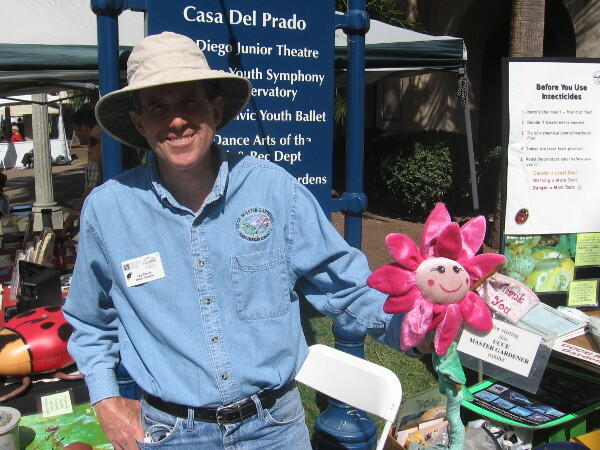 As I walked through San Diego’s garden-like Balboa Park, I searched the many exhibits for useful ideas about things we can do in our daily lives to protect the environment. Here are a few things I found. Please read the captions! And feel free to share! 1. 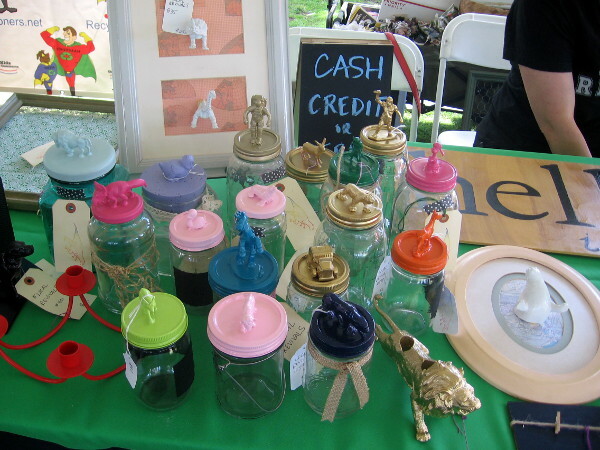 Ideas for creatively repurposing used household items. 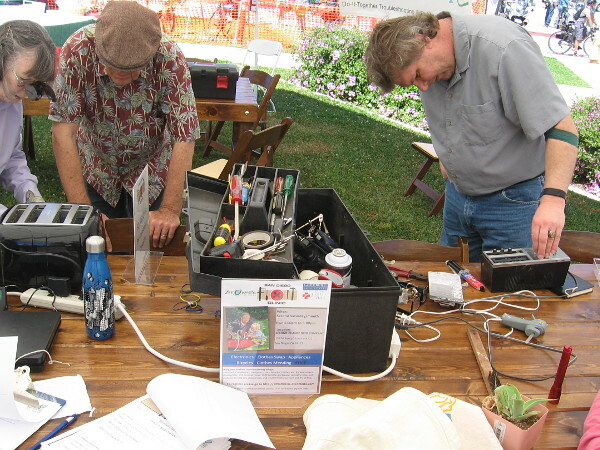 One major theme of EarthFair was re-using and repurposing old items that might otherwise be thrown away. I noted some cool ideas and took pics! 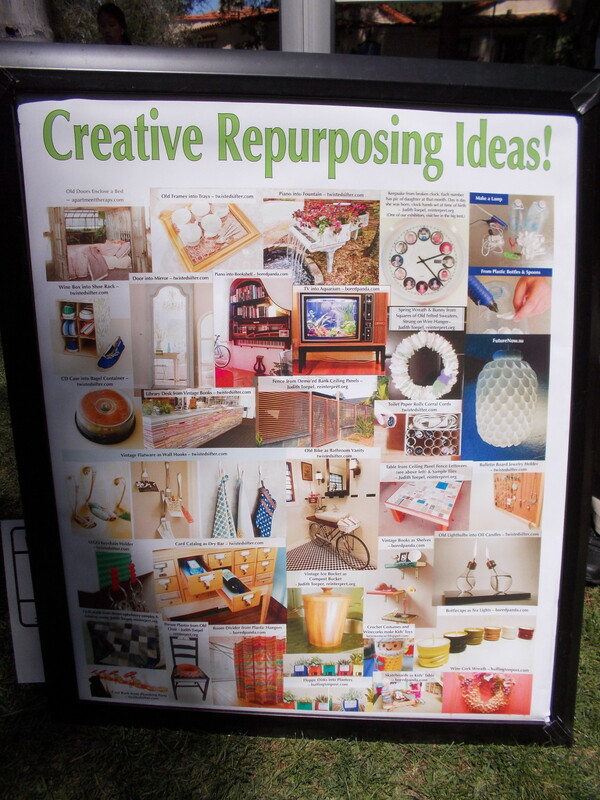 Poster shows many creative repurposing ideas! Click photo to enlarge and read some cool, very unusual ideas that you might try! 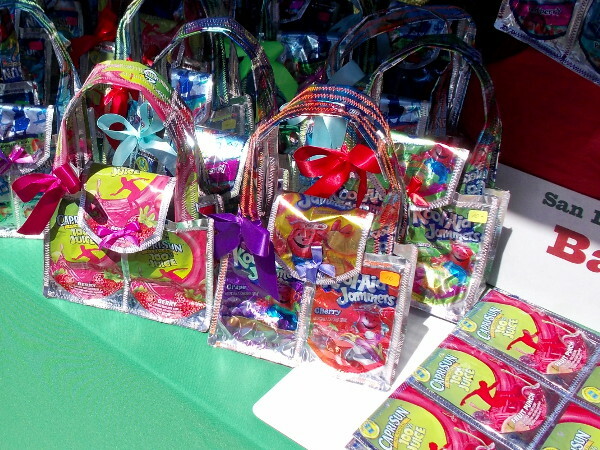 These shiny, colorful handbags were made from recycled Kool-Aid and Capri Sun packets! Take old clothes to make new clothes for homeless and toys for kids. Recycling vintage fabric into baby bibs. 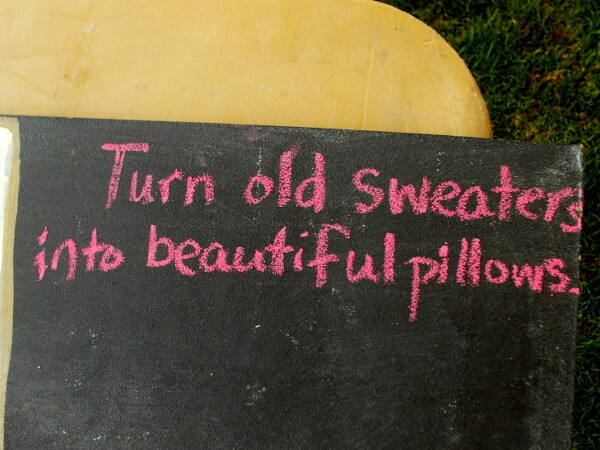 Turn old sweaters into beautiful pillows. 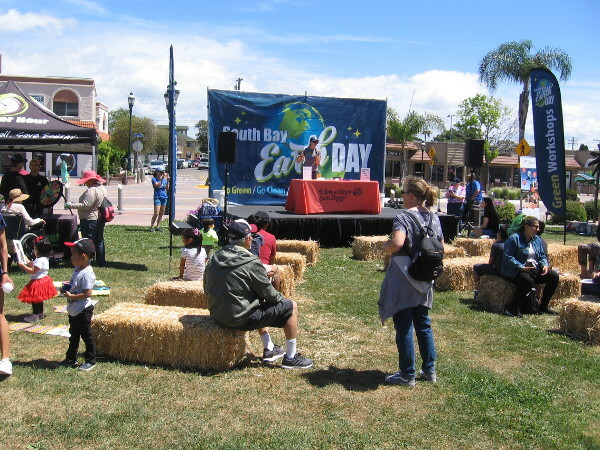 People check out the world’s largest festival celebrating Earth Day–EarthFair in San Diego’s sunny Balboa Park! 2. Tasty ways to use up excess fruits and vegetables. Spinach–add to sandwiches, soups, egg dishes, pasta or smoothies. Bananas–add to cereal, yogurt or smoothies. Blend frozen bananas with milk and vanilla for a healthy dessert. Citrus–add to green or fruit salads, soups, pasta or sauces. Add peels to vinegar for a simple household cleaner. Tomatoes–add to salads, egg dishes, sandwiches or pasta. Use to make fresh salsa, tomato sauce or bruschetta. Onions–add to salads, soups, egg dishes, sandwiches or stir-fry. Pickle red onions. Make onion preserves. Peppers–add to sandwiches, salads, egg dishes or stir-fry. Steam and puree to make soup or a sauce for meat or pasta. Avocados–add to smoothies, salads, sandwiches, egg dishes or baked goods. Spread on toast. Use in pasta sauce with lemon, garlic, oil and basil. Beets–add to salads, soups or stir-fry. Use roasted beets in place of meat on sandwiches. Broccoli and Cauliflower–add to salads, soups, egg dishes or stir-fry. Add finely chopped or grated cauliflower to rice. Berries–add to fruit or green salads, hot or cold cereals, smoothies or yogurt. Use in a fruit salsa served with bread or chips. Potatoes–add to salads, soups or egg dishes. Use russet potatoes to make potato skins. Use leftover baked potatoes to make hashbrowns. Corn–add to soups or salads. Use to make a fresh corn salsa. Bake into cornbread or potato pancakes. 3. 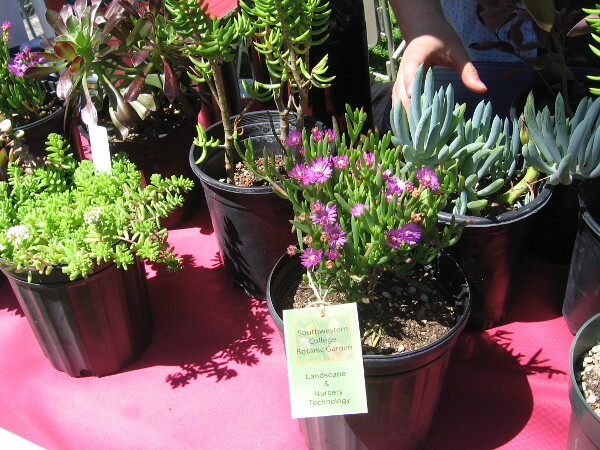 Things you can do to help protect the environment–and save money! Here are a few displays I photographed that contained some great advice! Click the photos to enlarge them! 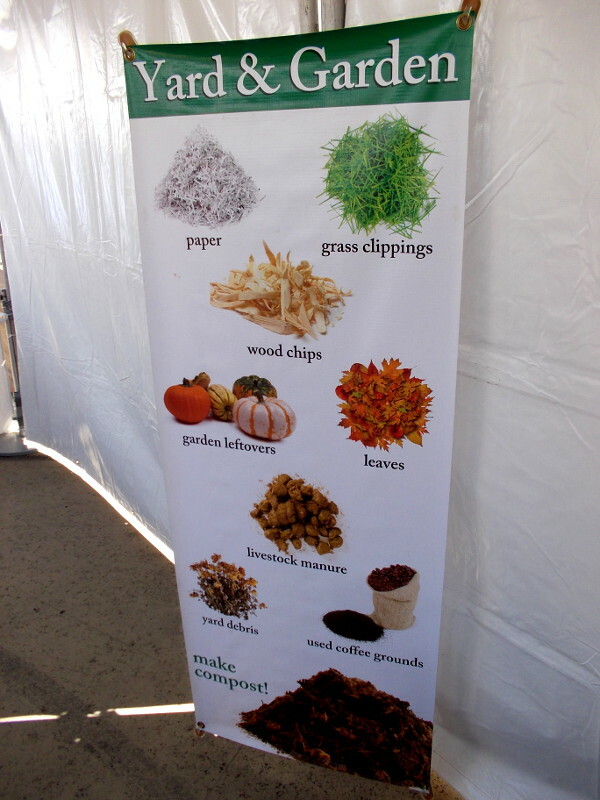 Compost can be made with shredded paper, grass clippings, wood chips, garden leftovers, leaves, livestock manure, chopped up yard debris and used coffee grounds. To save energy, use efficient lighting, adjust your thermostat, install solar, reduce driving, and keep your car maintained and tires properly inflated. Check to see if your city offers free utility inspections and efficiency analysis. 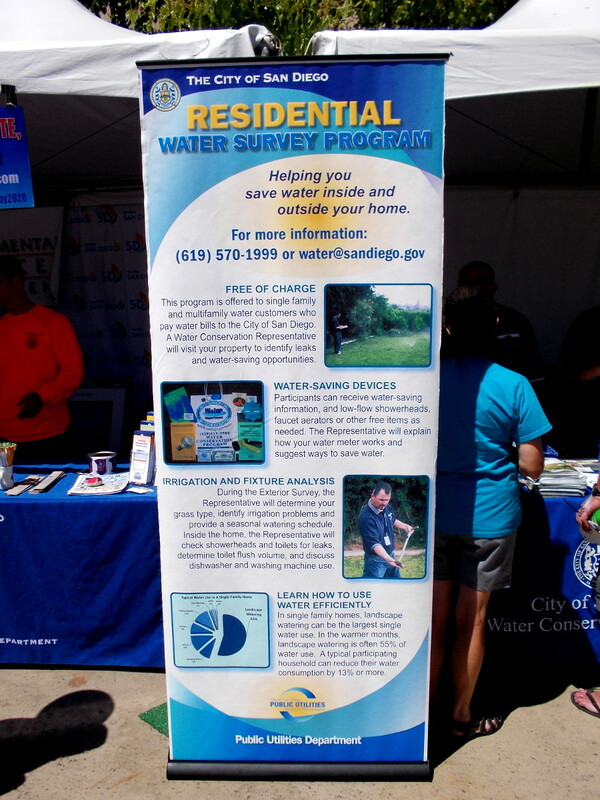 In San Diego, a free water survey program is available. Ride a bicycle to work! 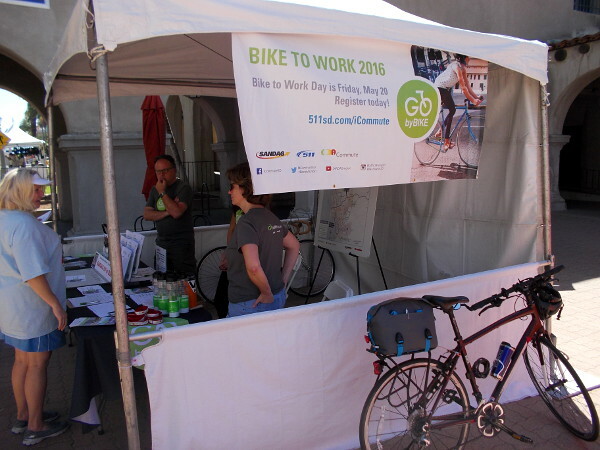 In San Diego, Bike to Work Day in 2016 is Friday, May 20. 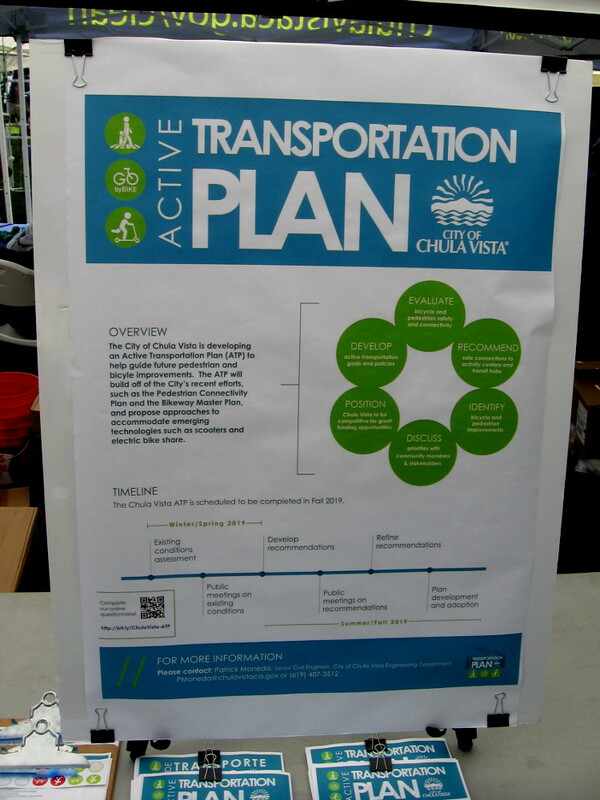 You might consider walking or taking public transit, too! 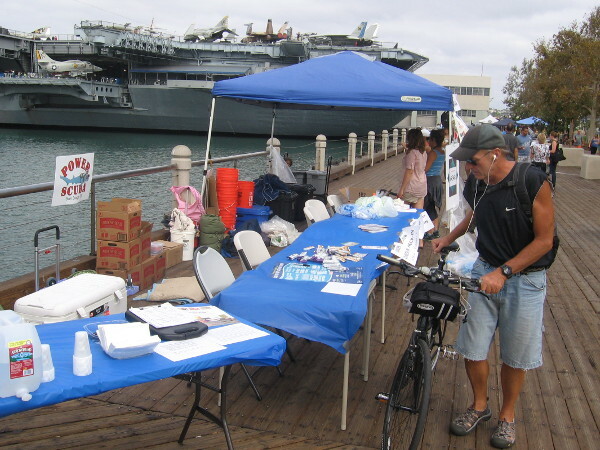 Many San Diegans saved energy, reduced air pollution and stayed healthy by riding their bicycles to EarthFair! 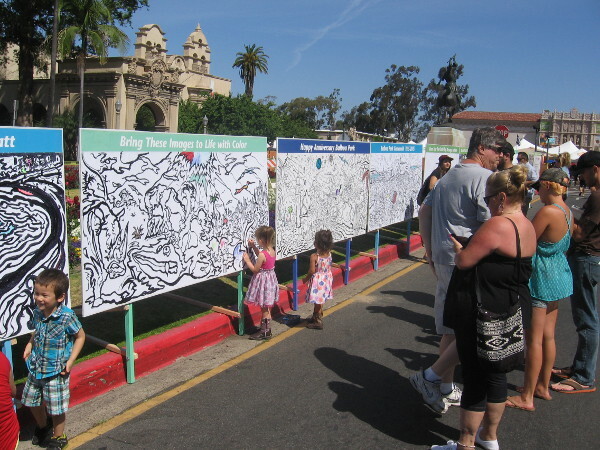 Do you love Balboa Park? Follow my special new blog which I call Beautiful Balboa Park! 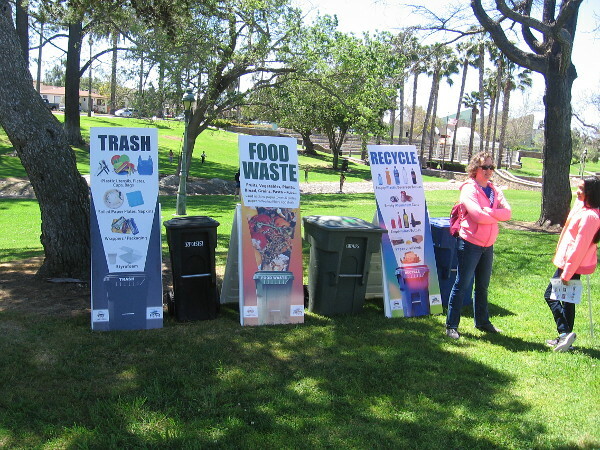 Posted on April 17, 2016 April 18, 2016 Tags balboa park, bicycling, clothing, cool, creativity, earth day, environment, festivals, food, garbage, ideas, recycling, san diego, transportation6 Comments on Help protect the environment: Cool ideas at EarthFair. Setting a new world record helps the environment! 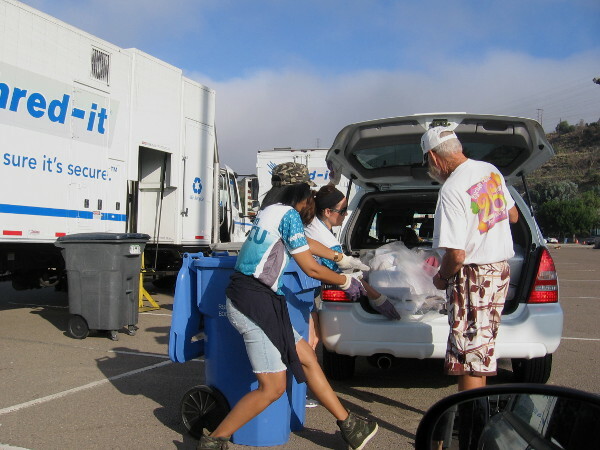 San Diego County Credit Union and Shred-it team up to attempt a new world record for paper collection and shredding! 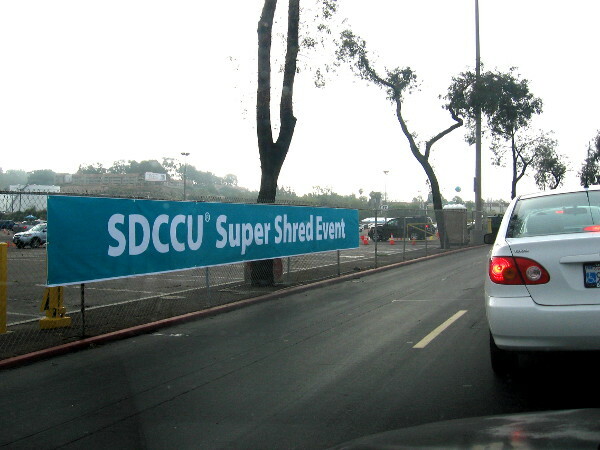 The huge SDCCU Super Shred Event is underway right now as I type! The event is an attempt to break the world record for paper collection in a single location during a 24 hour period! San Diego County Credit Union already holds the official Guinness World Record. Today they’re trying to break it. So why was I there taking photos? I collect my old records in a box at home, and whenever SDCCU offers free shredding, I head on down to take advantage of the service which is available to anyone. 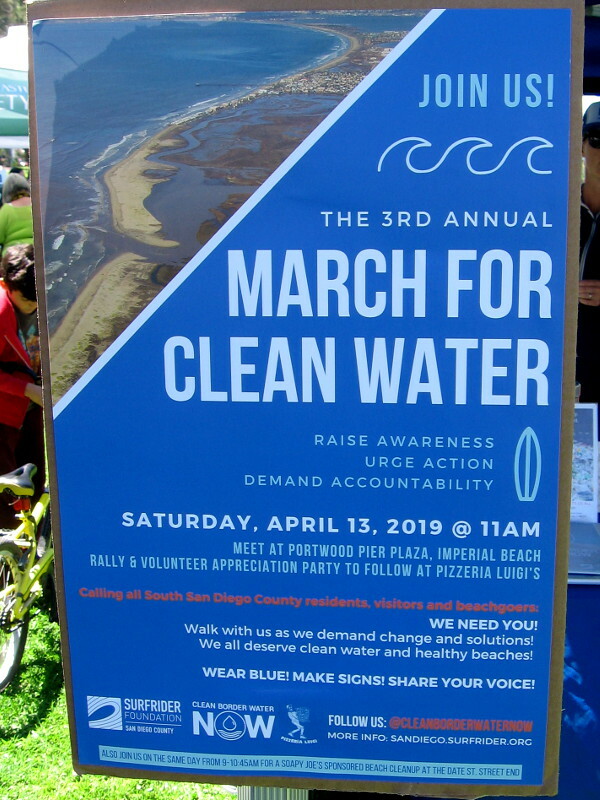 This morning the annual event, taking place in Mission Valley’s gigantic Qualcomm Stadium parking lot, is bigger than ever. So I brought my camera! Not only does shredding paper documents protect against identity theft, but recycling paper is good for our environment. So this event is pretty cool for a whole variety of reasons! 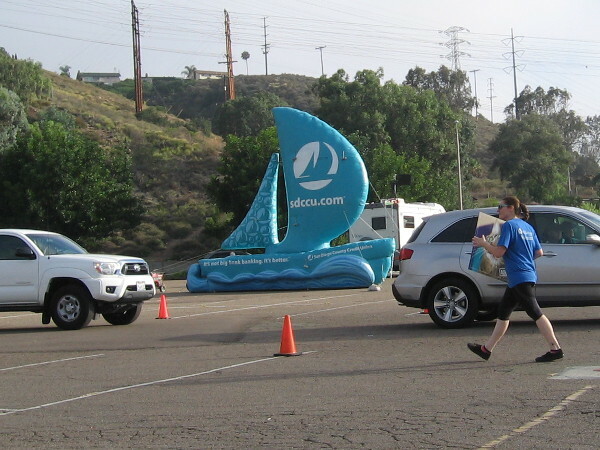 The SDCCU Super Shred Event held in the Qualcomm Stadium parking lot. Unlimited free shredding helps fight identity theft! 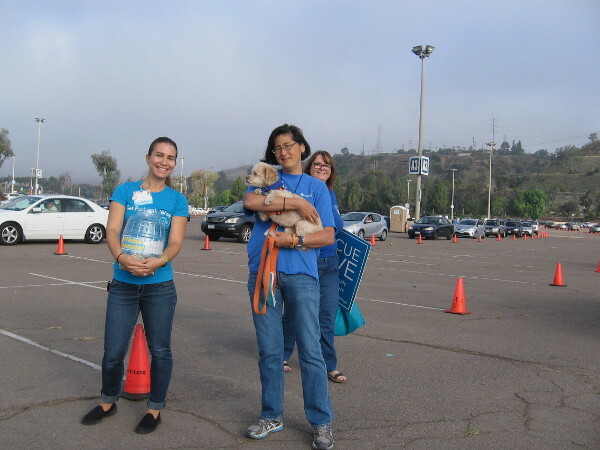 As cars queue, volunteers collect donations for the San Diego Humane Society and SPCA. 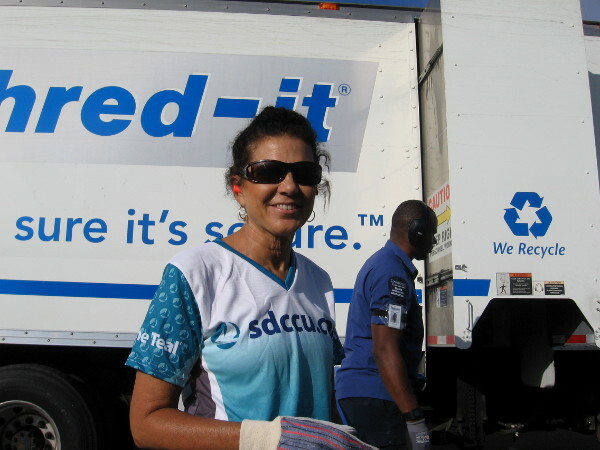 SDCCU already holds the world record for most paper collected in a single location in a 24 hour period. 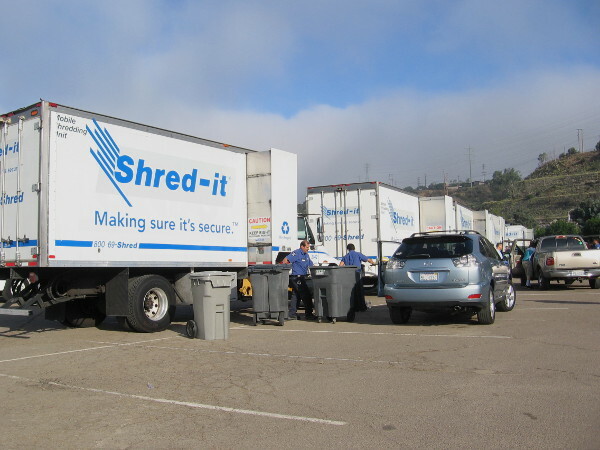 Shred-it, a document destruction and recycling company, had a whole fleet of trucks ready for the big event! A super nice volunteer smiles for my unexpected camera. Thank you! See photos of some random cool stuff! Join me on Facebook or Twitter. 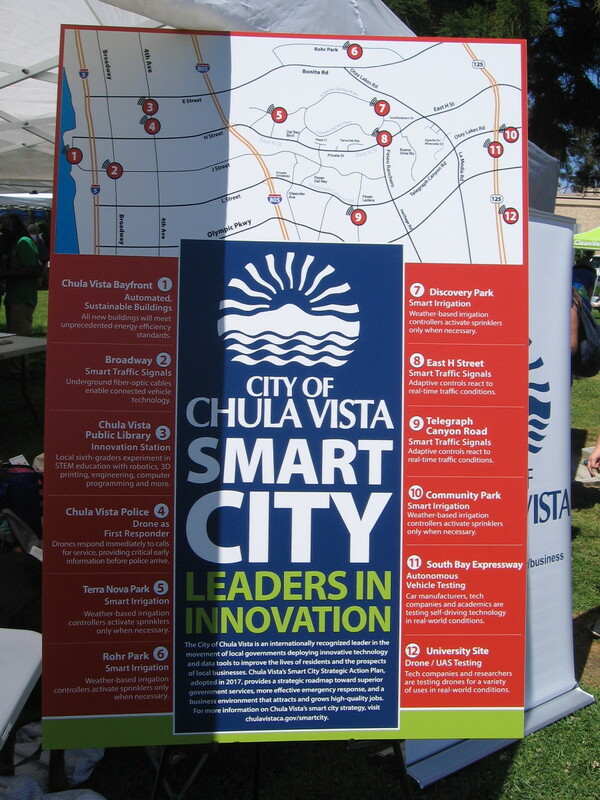 Posted on July 25, 2015 Tags blog, blogging, business, cool, environment, events, mission valley, news, qualcomm stadium, recycling, san diego, volunteering4 Comments on Setting a new world record helps the environment! Recycled plarn sculpture at Horton Plaza. Close look at beautiful plarn artwork exhibited on lower level of downtown San Diego’s Horton Plaza. Should one walk through downtown San Diego’s colorful Horton Plaza shopping mall, one might see an unusual work of art. I took some photos for everyone to enjoy. This sculpture is called Grow and is made of crocheted plarn. What the heck is plarn? It’s plastic yarn! 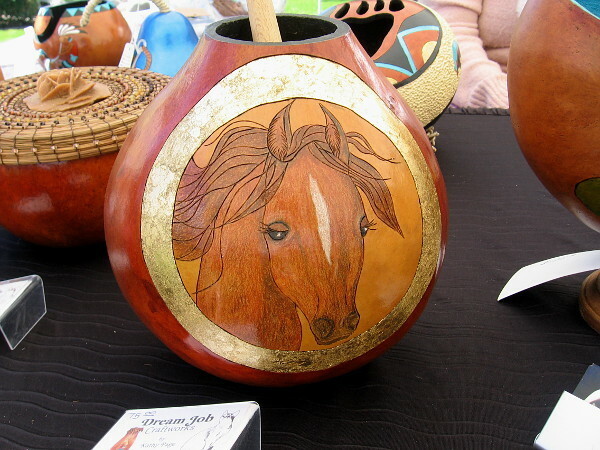 I once watched a lady making the interesting material at Balboa Park’s annual EarthFair. Plastic bags, once converted into plarn, do in fact resemble yarn! 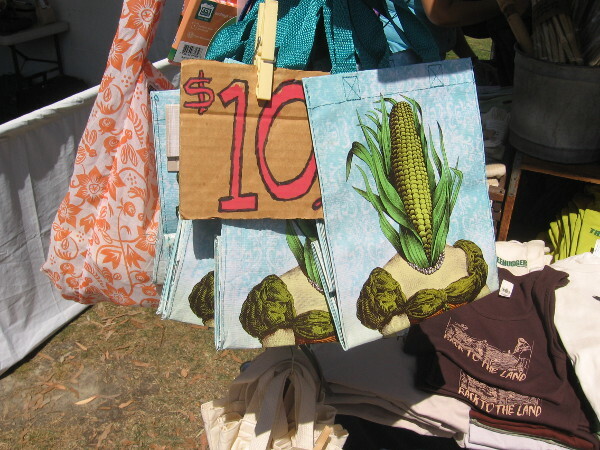 What a unique and environmentally friendly way to reuse plastic shopping bags! Grow is an upcycle sculpture depicting a play between natural and synthetic elements. 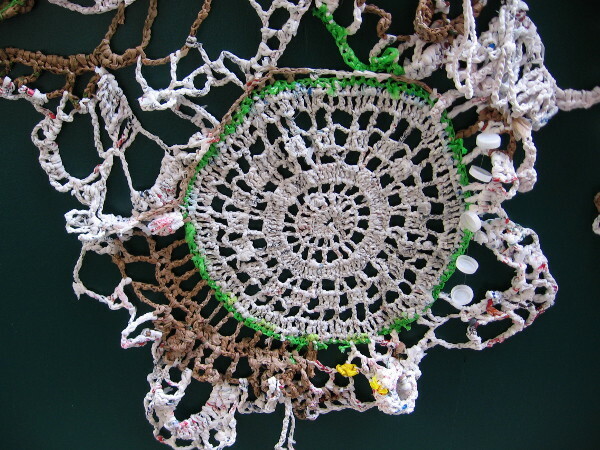 For this project, discarded plastic grocery bags were hand crocheted to form the plarn installation. 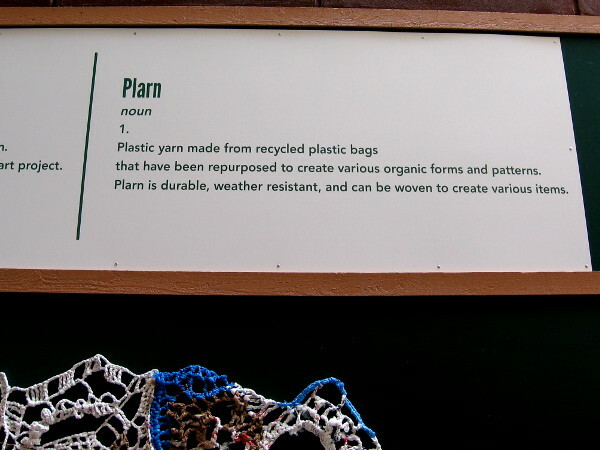 Plarn is plastic yarn made from recycled plastic bags. It is durable, weather resistant, and can be woven to create various items. 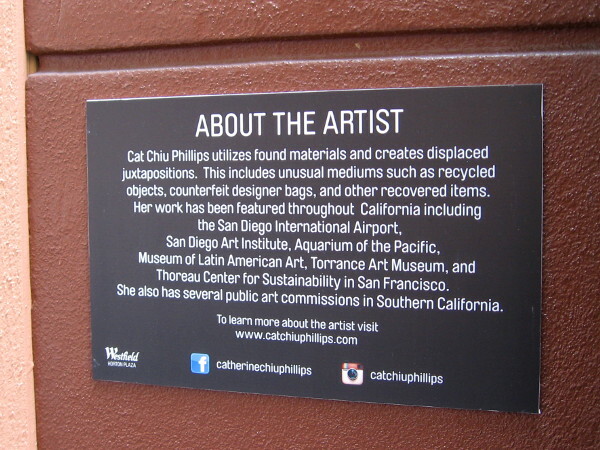 The artist Cat Chiu Phillips utilizes found materials and creates displaced juxtapositions. 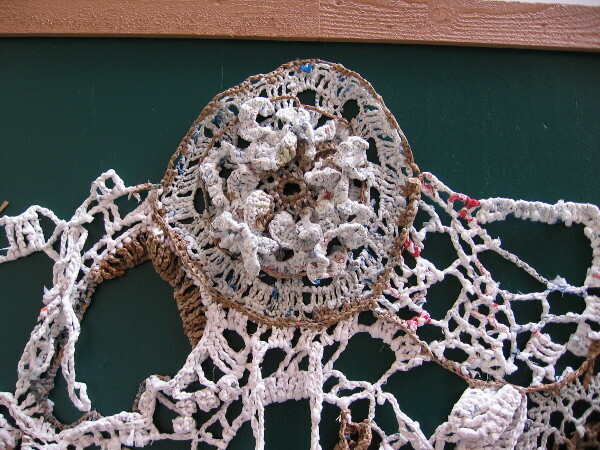 She includes unusual mediums such as recycled objects. 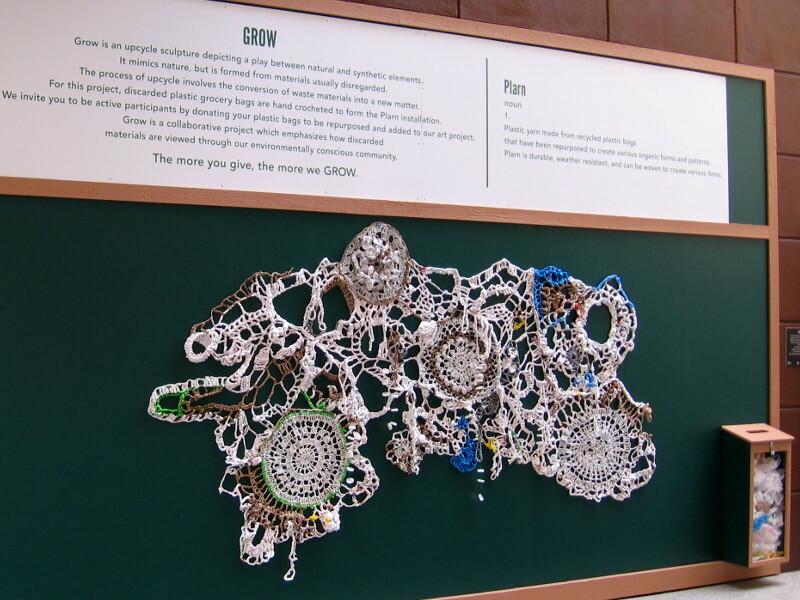 Work of art, titled Grow, can be examined up close by visitors and shoppers walking through the Horton Plaza mall. 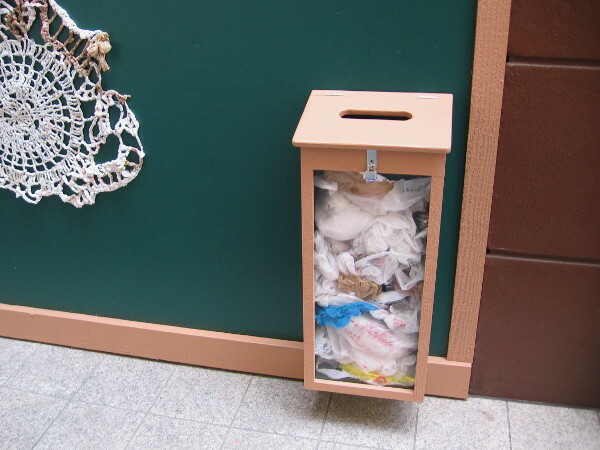 A box by the fantastic plarn sculpture invites passersby to recycle their plastic shopping bags. 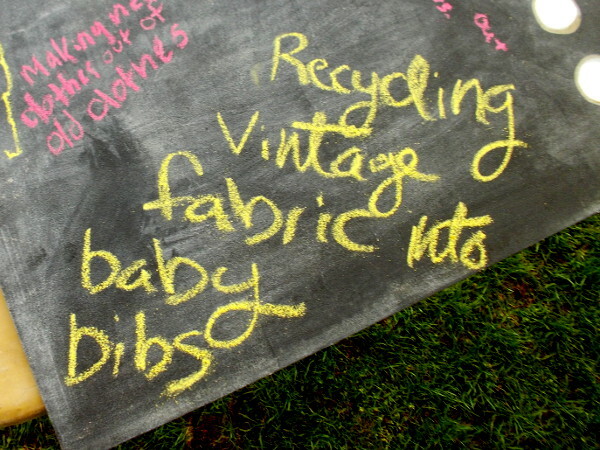 Posted on May 18, 2015 April 16, 2019 Tags art, artists, creativity, downtown, environment, horton plaza, public art, recycling, san diego, sculpture, shopping, unusual2 Comments on Recycled plarn sculpture at Horton Plaza. 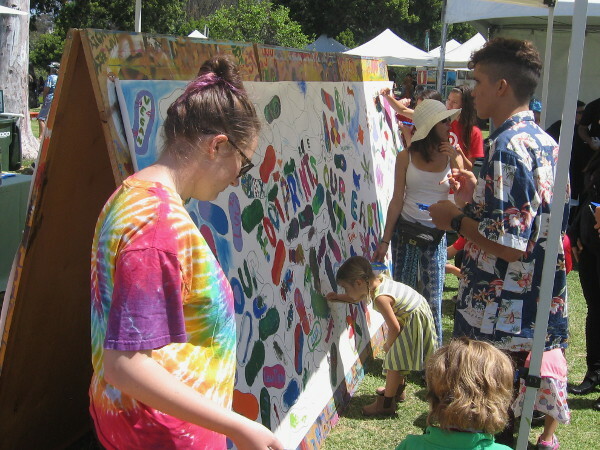 Art, smiles and activism at 2015 EarthFair! EarthFair was held in San Diego’s Balboa Park to celebrate Earth Day. Late this morning I took a walk through this year’s EarthFair. You might have seen my blog last year, when I posted photographs from the gigantic event. 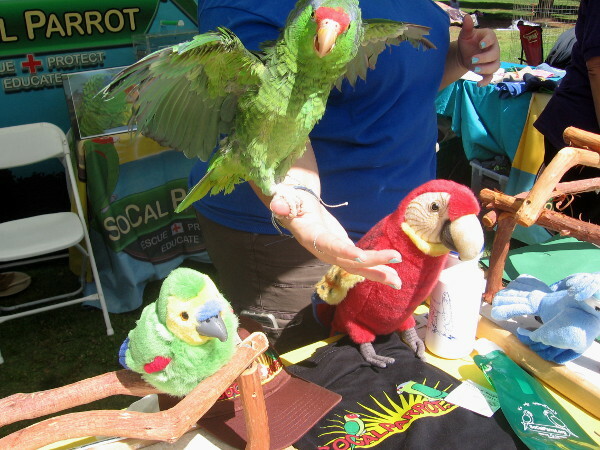 Every year EarthFair attracts tens of thousands of enthusiastic San Diegans to Balboa Park to celebrate Earth Day. 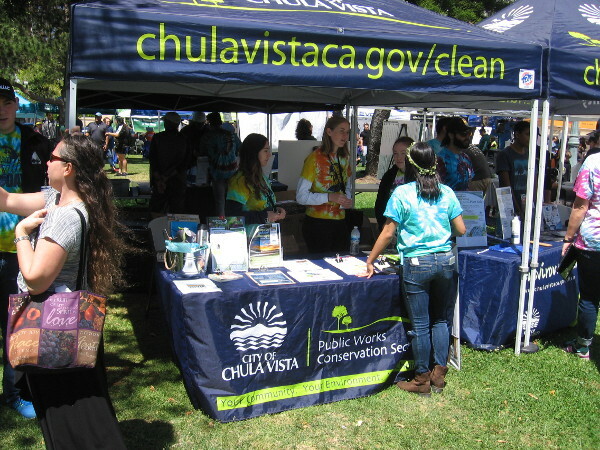 It’s billed as the largest free annual environmental fair in the world, and that sounds true to me! It’s huge! 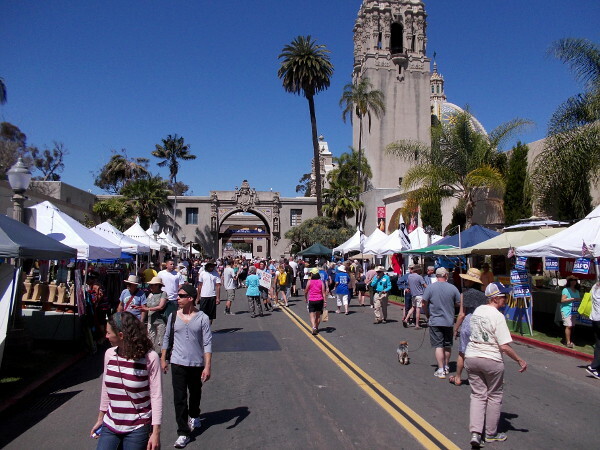 Many of the over 300 exhibitors throughout Balboa Park can be seen at the event every year, and last year I featured many in photos. So I figured this year I’d focus slightly more on close up images. 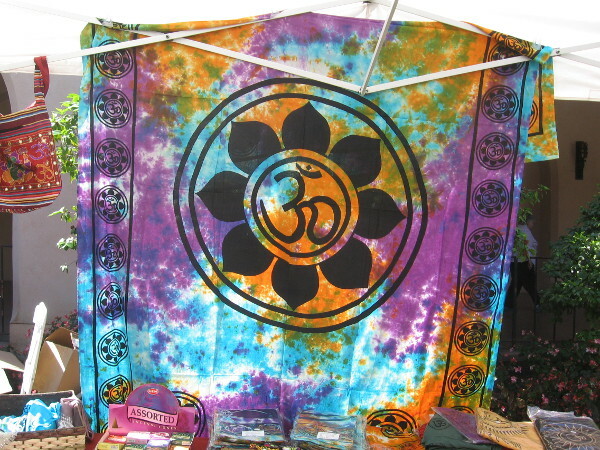 Super colorful art on signs, shirts, gifts and canvases provided many opportunities for my camera. I also saw a lot of smiles! Cool graphic on official EarthFair shirt. 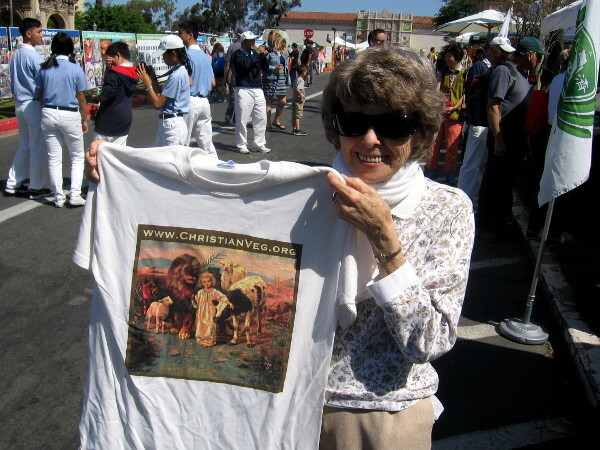 The annual Balboa Park event attracted a huge crowd as usual! 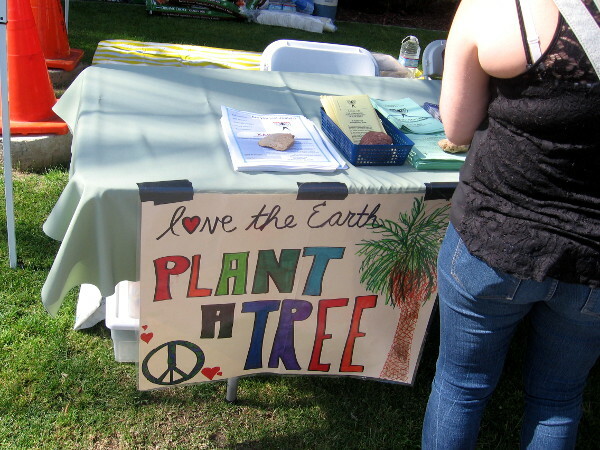 One of many handmade signs with environmental messages… love the Earth. Plant a tree. 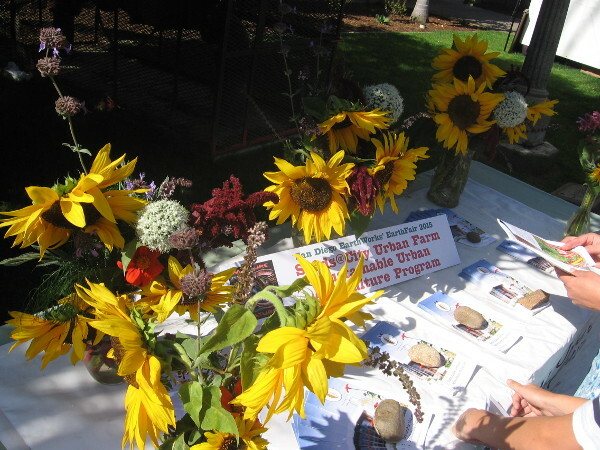 Bright sunflowers on table of urban farming advocates. 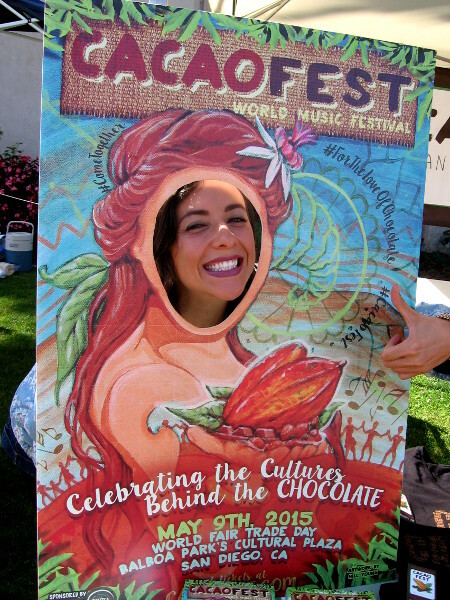 Super smile promoting the Cacaofest, which celebrates the cultures behind the chocolate! I’m there! 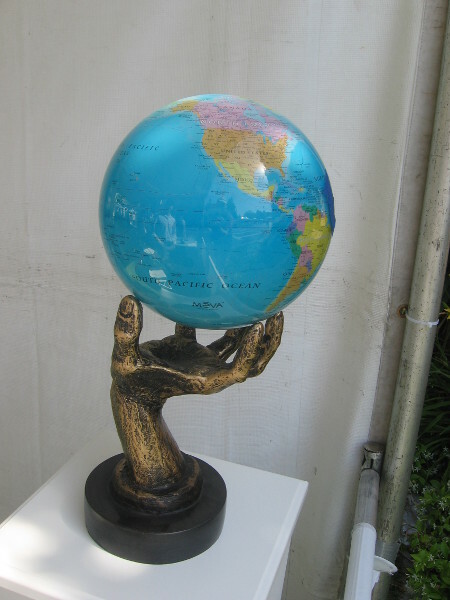 Solar-powered rotating globe held in a sculpted human hand. 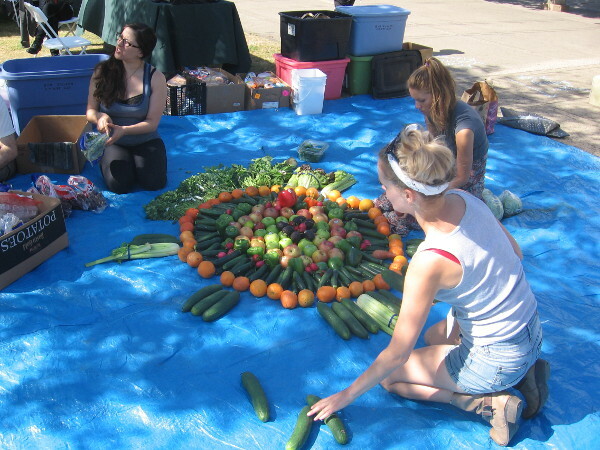 Creating art out of perfectly good food saved from dumpsters. I blogged about these guys last year! Donate Don’t Dump is a project undertaken by Rob Greenfield. Check out my blog from last year, if you’d like! 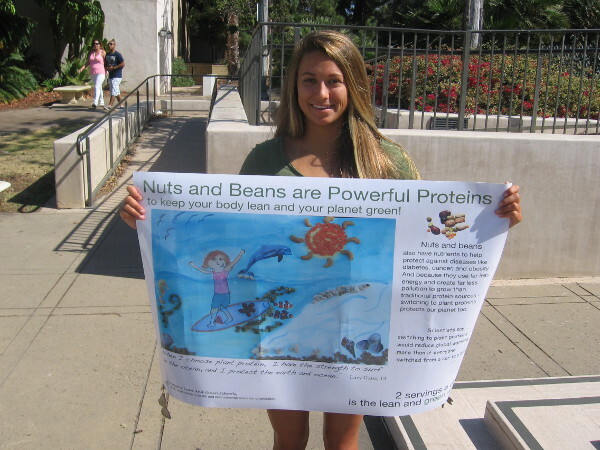 A powerful smile from the artist behind Nuts and Beans are Powerful Proteins! 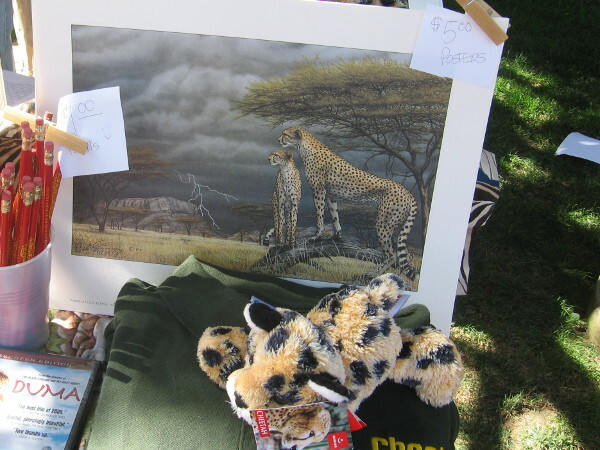 Protecting animals was one major theme at EarthFair. 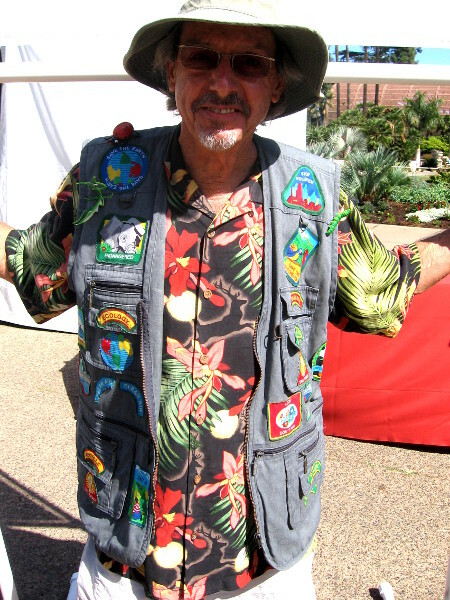 This cool guy is Dr. Wilderness. He had a family magic show. Great outfit! 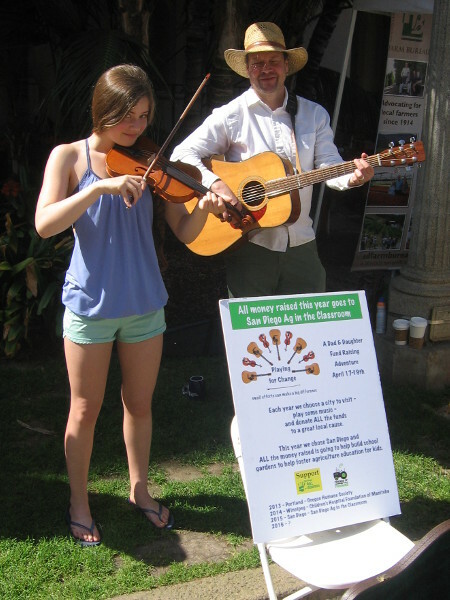 This cheerful Dad and daughter musical duo was raising money to help build school gardens. A flower and a smile. I learned how copper gives slimy snails an electrical shock! 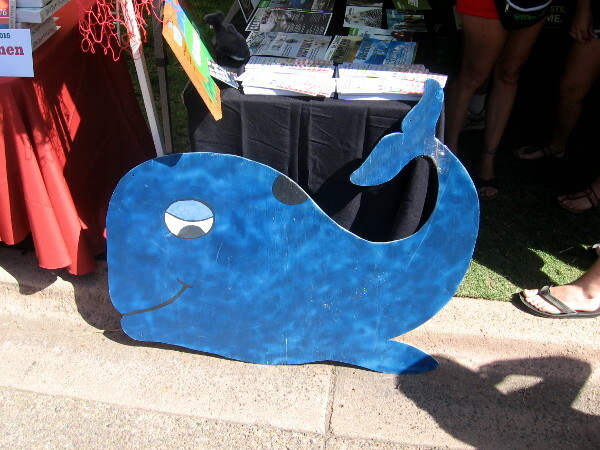 A happy blue whale out of water. 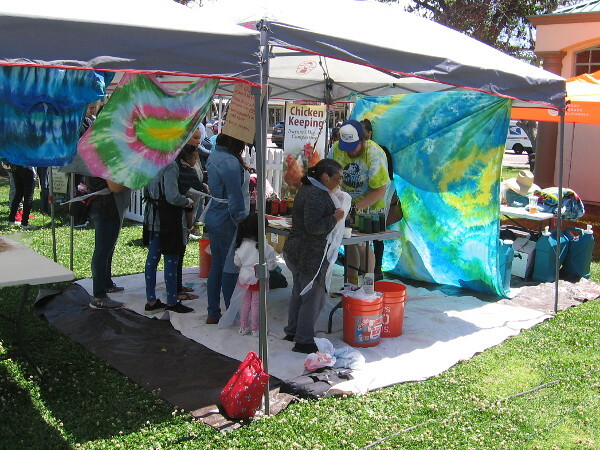 Lots of tie-dye could be seen throughout Balboa Park. 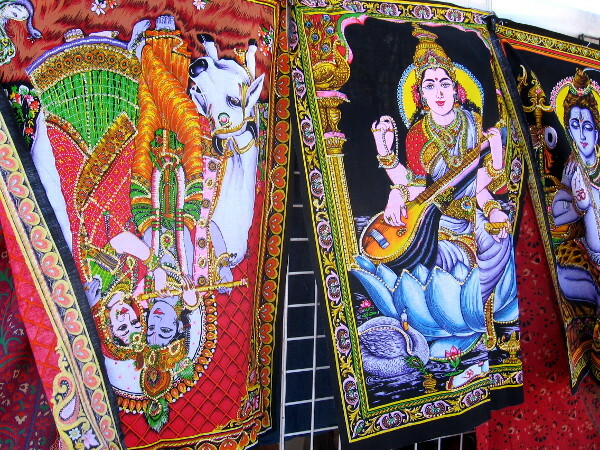 Many crafts, clothes and goods for sale featured lush color and spiritual imagery from Eastern religious traditions. 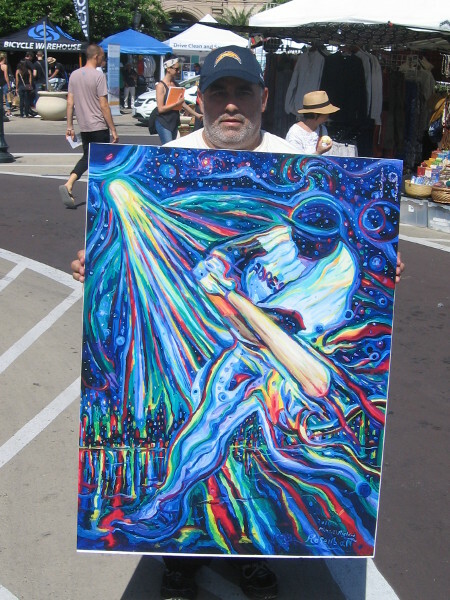 A super cool painting of Mr. Padre, Tony Gwynn, created by artist Michael Rosenblatt. Is this painting of local baseball legend Tony Gwynn awesome, or what? It has a Facebook page! 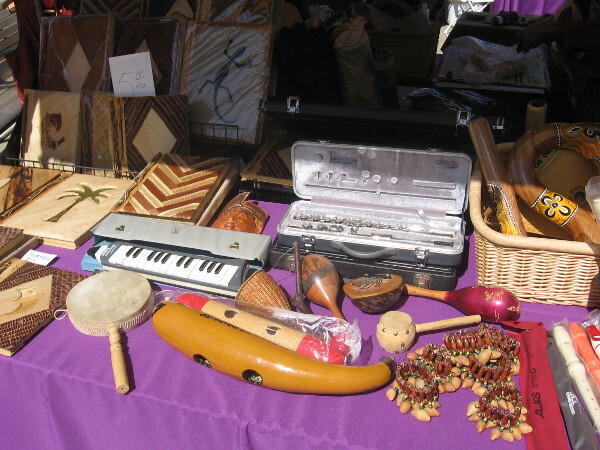 Lots of hand-crafted musical instruments were for sale. 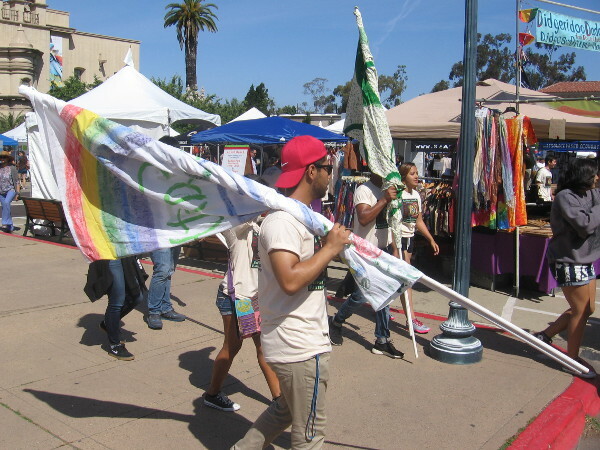 Some guys carry flags in preparation for a small Earth Day parade through Balboa Park. 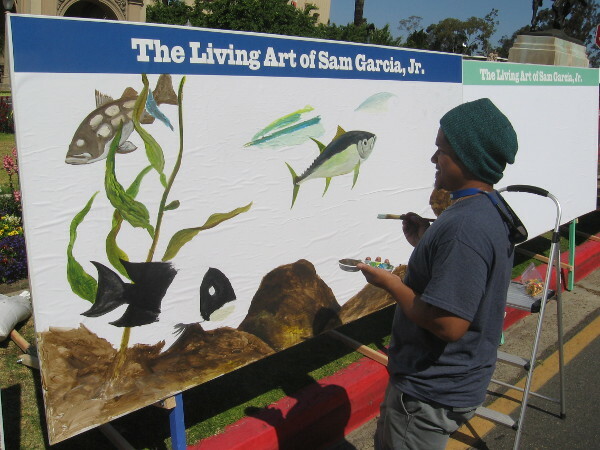 Sam Garcia, Jr. paints a canvas. 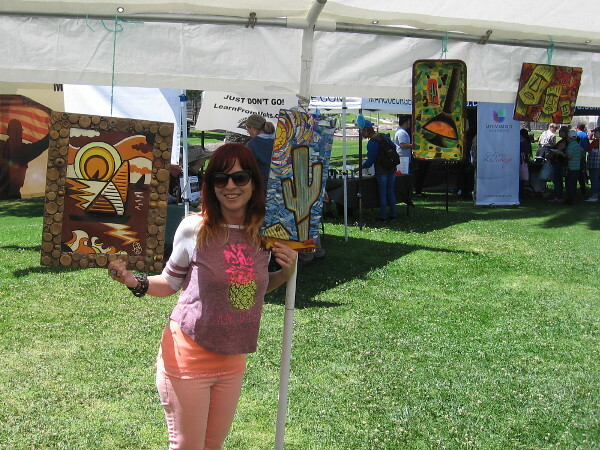 Several talented artists were at work for all to see. 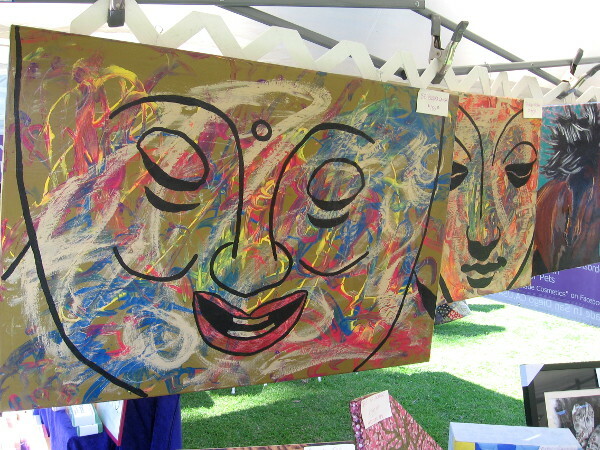 Creative kids (or adults) could color these huge panels however they pleased! Large panels on display featured fantastic artwork, many images with a 1960s feel. This human skull really caught my attention! Beautiful wild animals in an exotic nature scene. What’s your sign? 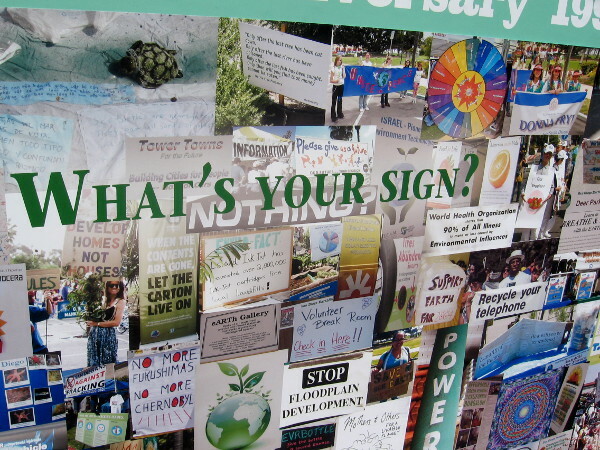 This panel showed activist signs photographed during the 25 years of EarthFair. This very nice Quaker lady advocates vegetarianism. 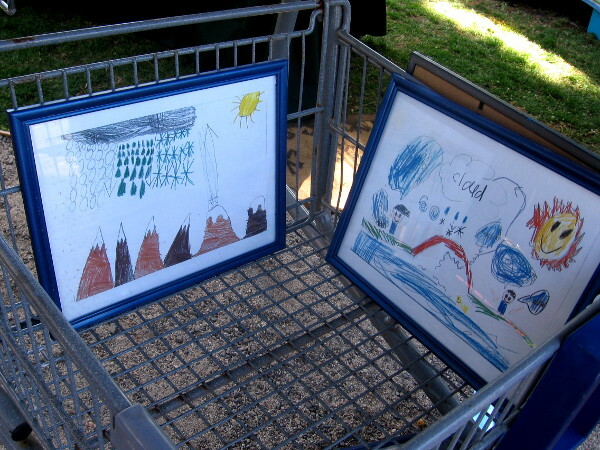 Kids’ art shown at The Project Lennon table. This organization promotes peace and positive outlets for urban youth. 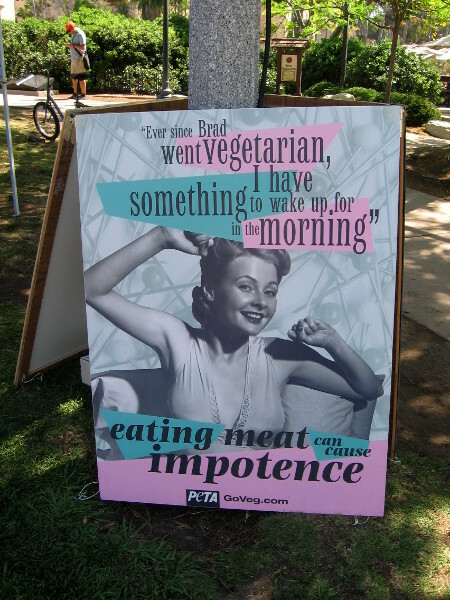 Various vegan and vegetarian groups had different booths and some humorous signs. I wonder what the animal rights folks would think of this? 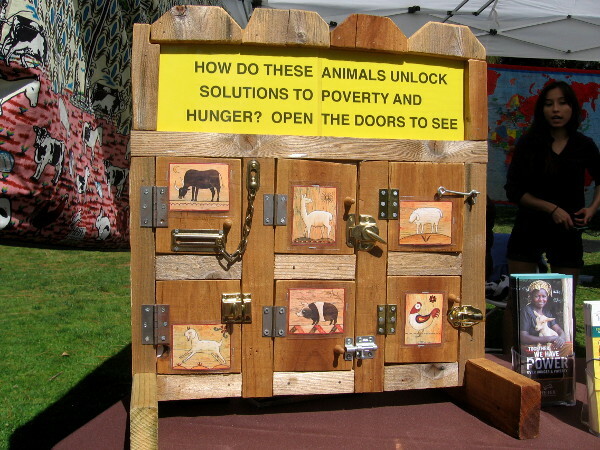 Animals used to fight poverty and hunger! Which one of these is the real animal? That happy parrot on top! 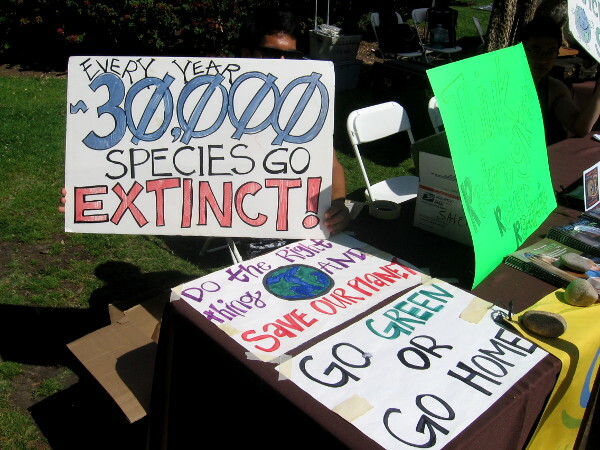 Sign states that every year 30,000 species go extinct. 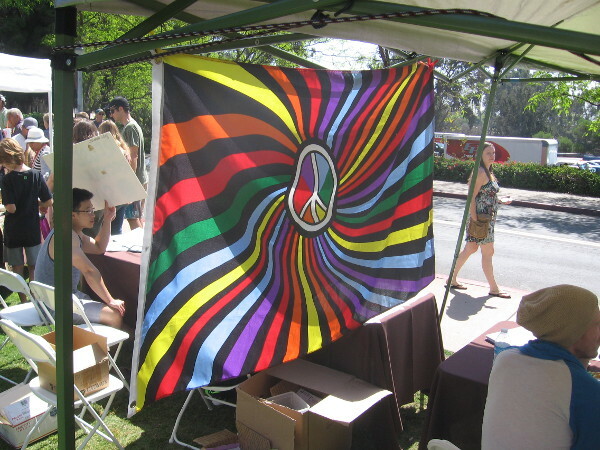 I saw lots of banners with peace signs and rainbow colors. 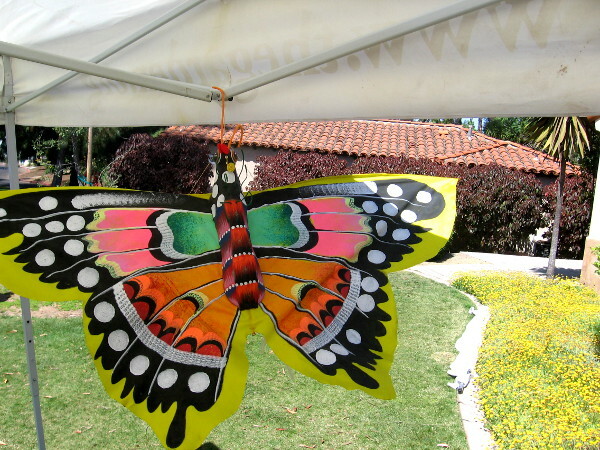 This butterfly was flitting about in the San Diego spring breeze. Food was also a major topic, and appeared in unusual works of art. 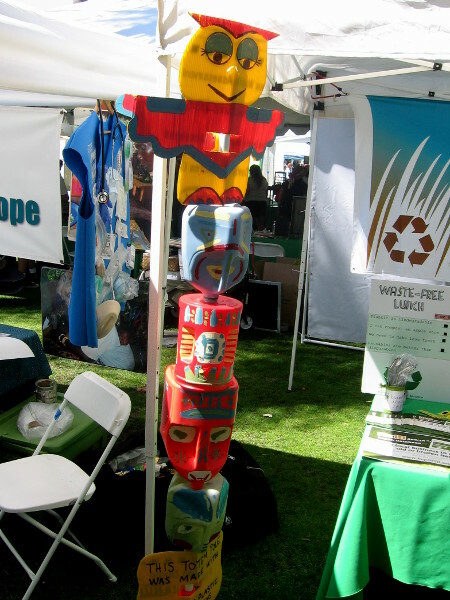 This totem pole was made of recycled materials! 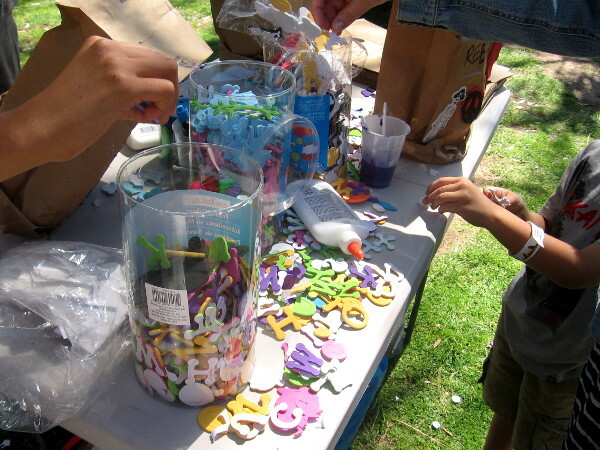 A table in the kids activity area promoted imagination and creativity. 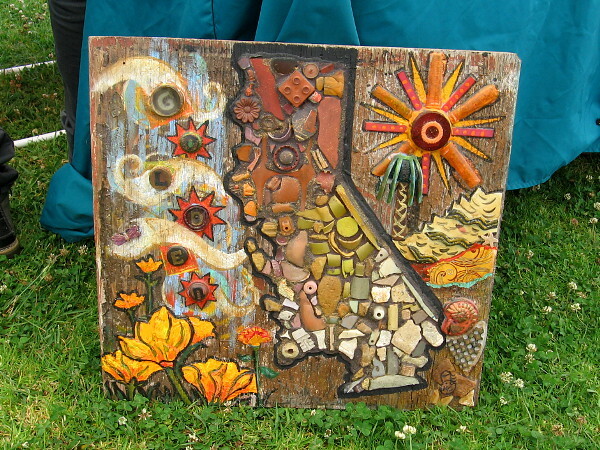 Harry Eubanks of Rivers Eden paints cool art on old bits of wooden fencing. 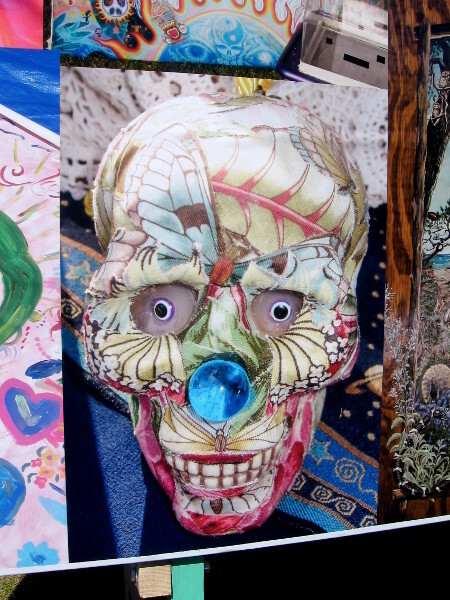 Fun art from recycled everyday items in the Repair and Reuse tent. 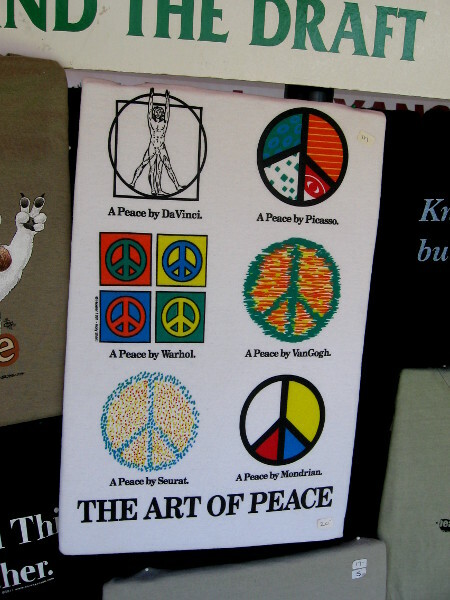 The art of peace by Da Vinci, Warhol, Picasso, Van Gogh and other famous artists. 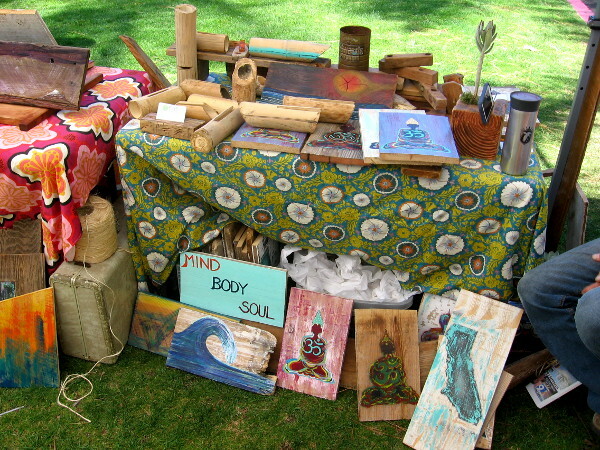 Arts and crafts were for sale in a large vendor area on the grass near Park Boulevard. 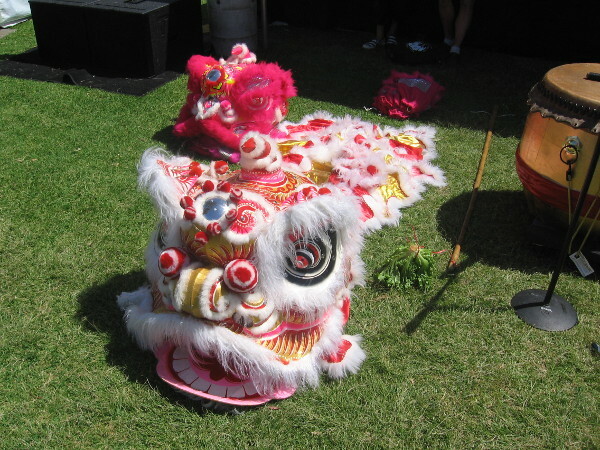 Lion dances would take place later in the day! Volunteer today! 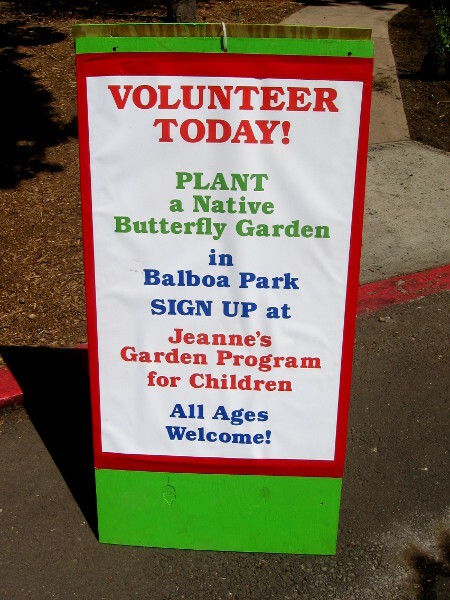 Plant a butterfly garden in Balboa Park! Do it! Art was encouraged everywhere I turned. 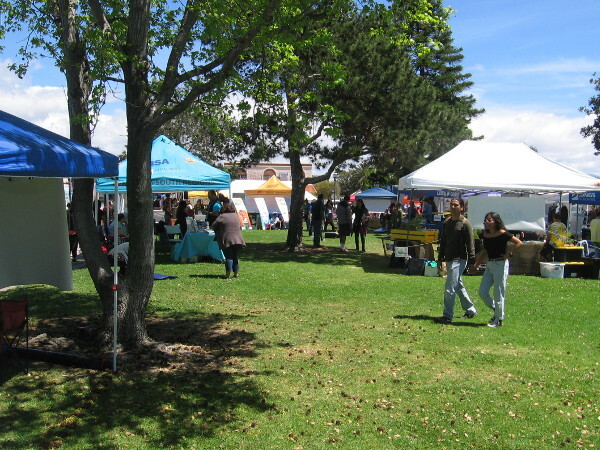 I enjoyed taking a walk through the 2015 EarthFair! 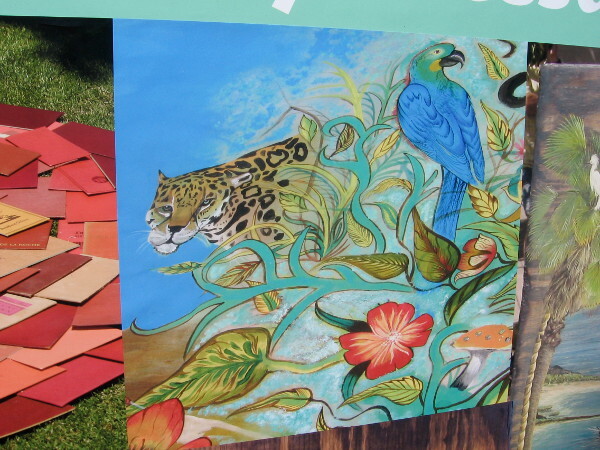 Posted on April 19, 2015 June 1, 2015 Tags activism, animal rights, animals, art, artists, balboa park, creativity, earth day, education, environment, events, nature, recycling, san diego9 Comments on Art, smiles and activism at 2015 EarthFair! 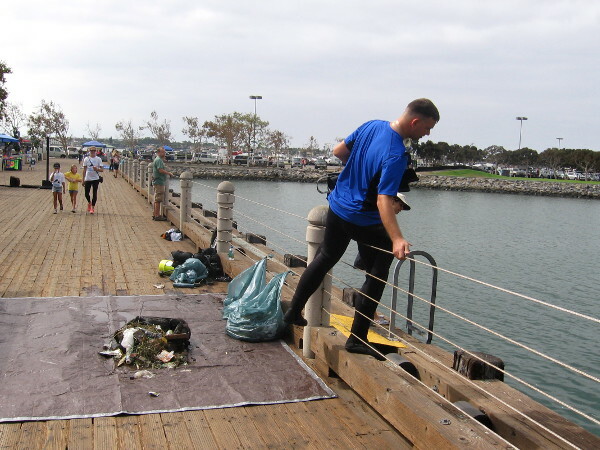 Scuba divers help clean up San Diego waterfront! 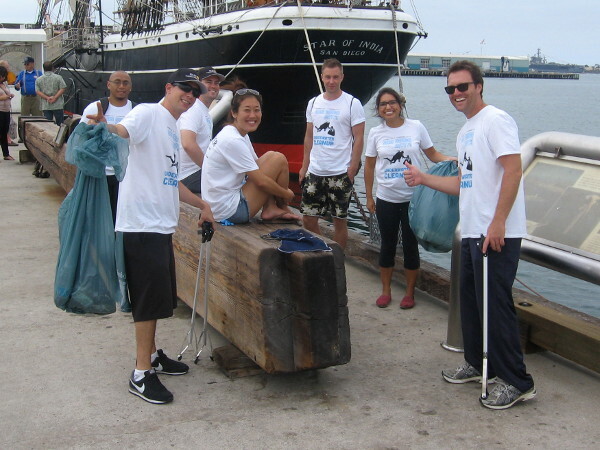 Volunteers help clean up our San Diego Bay near the Star of India. 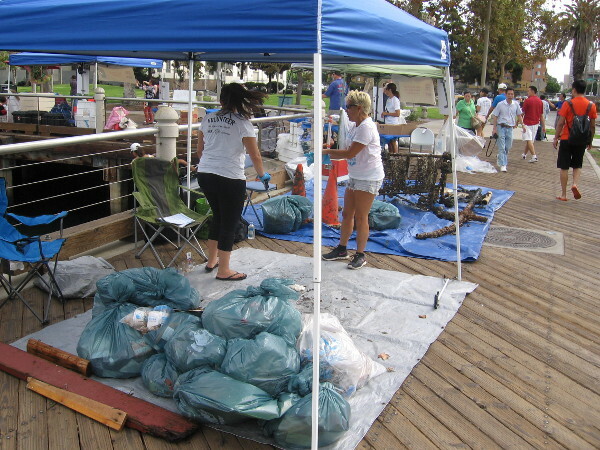 The annual San Diego Bay Downtown Cleanup was held this morning! 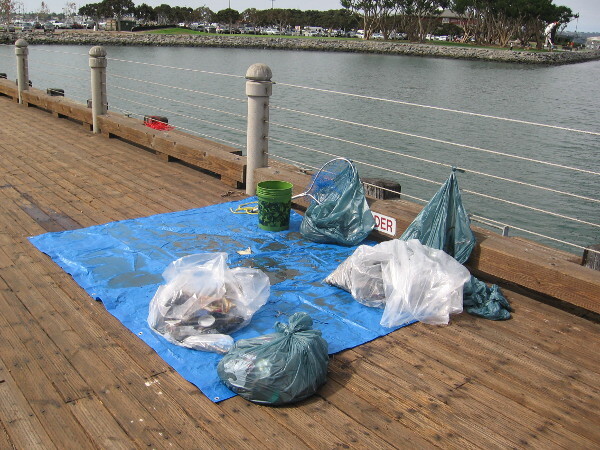 Local scuba divers cleaned up underwater garbage at the edge of our beautiful waterfront, while other volunteers assisted gathering trash above water. 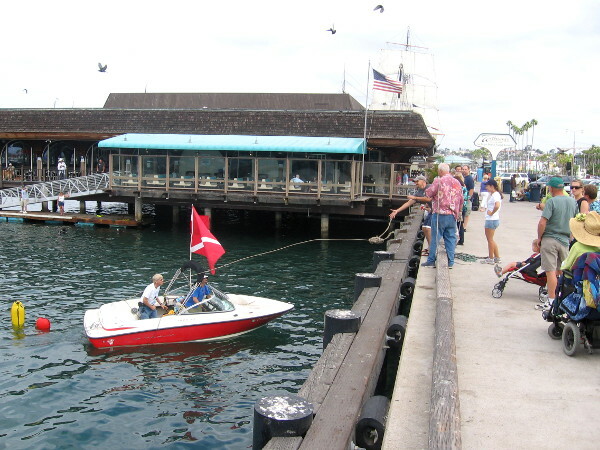 I walked along the Embarcadero from the San Diego Maritime Museum down to Tuna Harbor and took a bunch of cool photographs. Hopefully these pics provide a little inspiration! Let’s make the world more clean and beautiful! This guy was assisting divers removing trash along the Embarcadero. 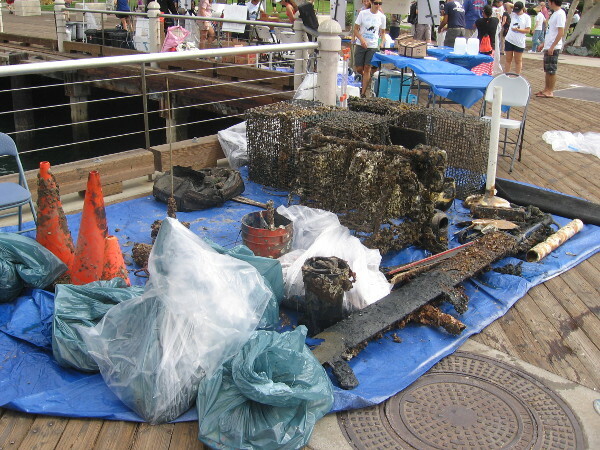 Power Scuba and Control Group teamed up for downtown waterfront cleanup event. 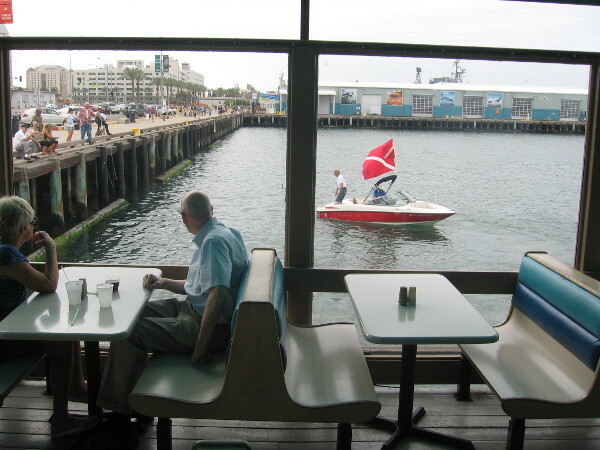 Looking out at dive boat from inside Anthony’s Fishette. Many San Diegans assisted in various ways, or just watched with curiosity. Bags of garbage were gathered throughout the morning to be hauled away later. 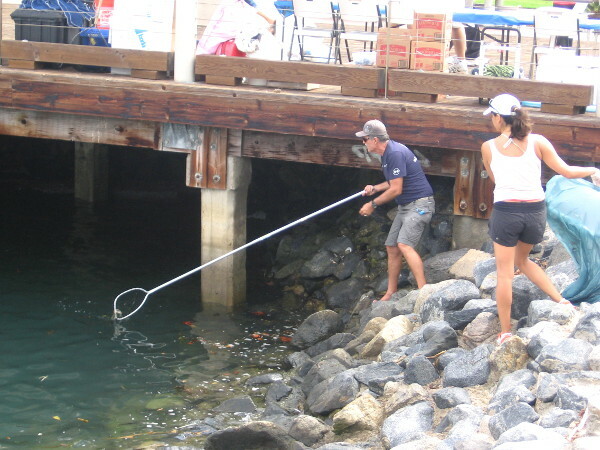 A participant checks out what’s going on in the water below. 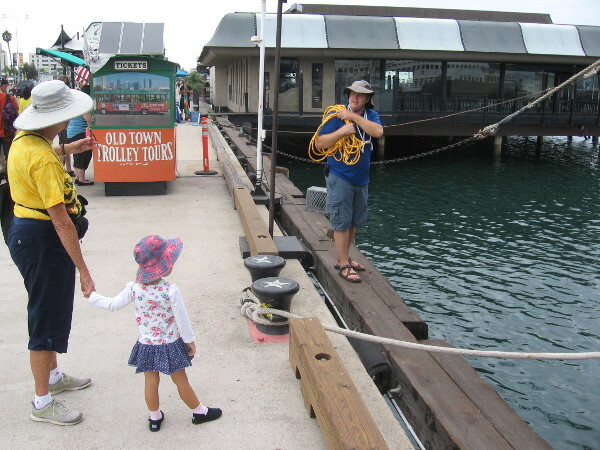 The boardwalk near the USS Midway was full of activity. 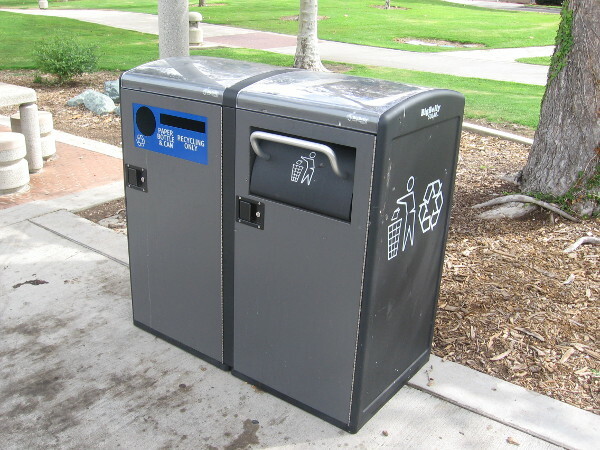 New trash compacting and recycling cans along the Embarcadero are solar powered. 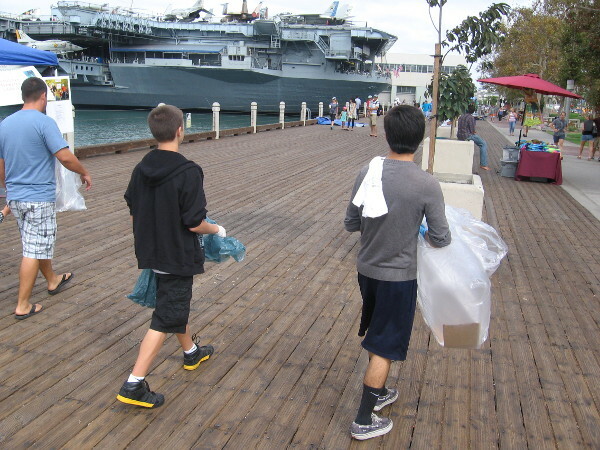 Old and young were helping out the environment, making our fine city even better. 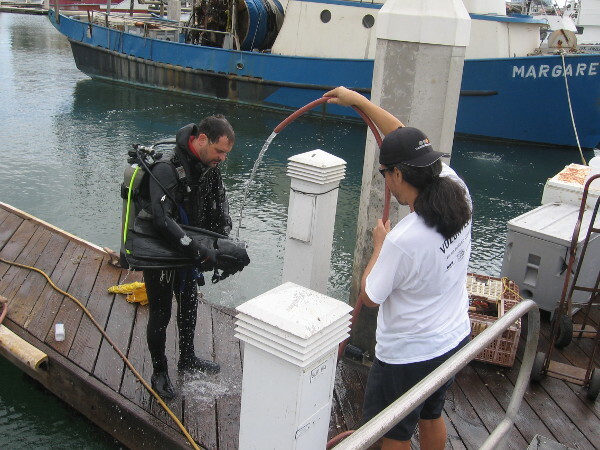 Scuba divers checked in here before beginning their underwater mission. Piles of garbage found in the bay include construction cones and a shopping cart. Bags of trash are collected as the morning progresses. Pool skimming nets were handy for removing floating litter and debris. 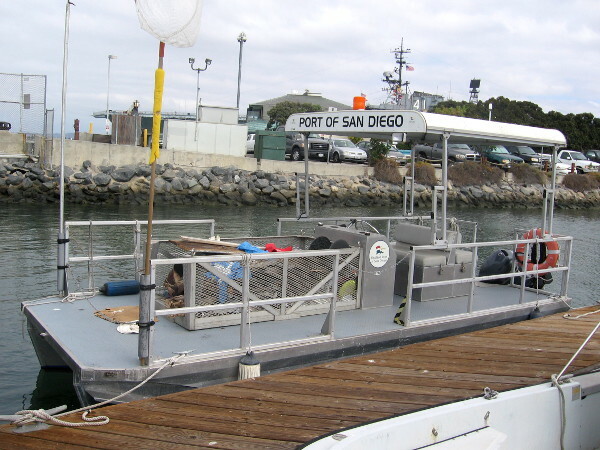 Port of San Diego’s boat Tsunami II is used to help clean the bay. 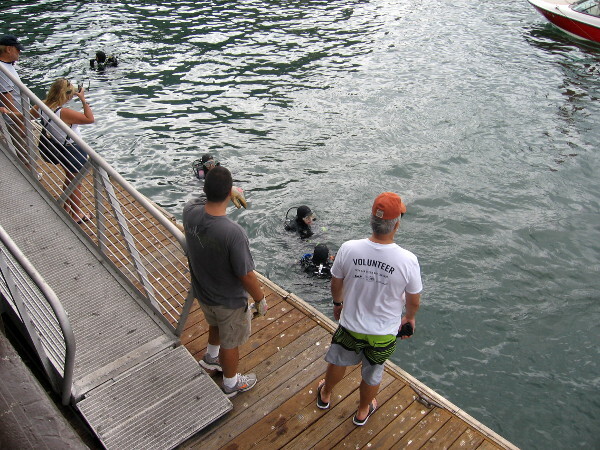 Scuba diver gets hosed off on Tuna Harbor dock after gathering trash. 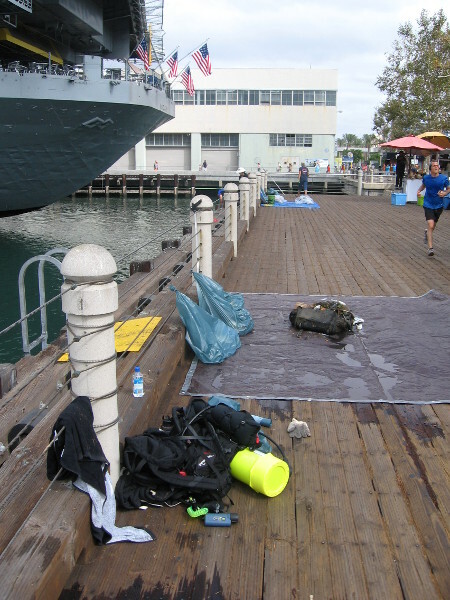 Posted on September 20, 2014 June 3, 2015 Tags beautiful, community, downtown, embarcadero, environment, events, inspiration, port of san diego, recycling, san diego, san diego bay, scuba diving3 Comments on Scuba divers help clean up San Diego waterfront!